Kikaprit des photos de mon atelier sans me le dire ?! 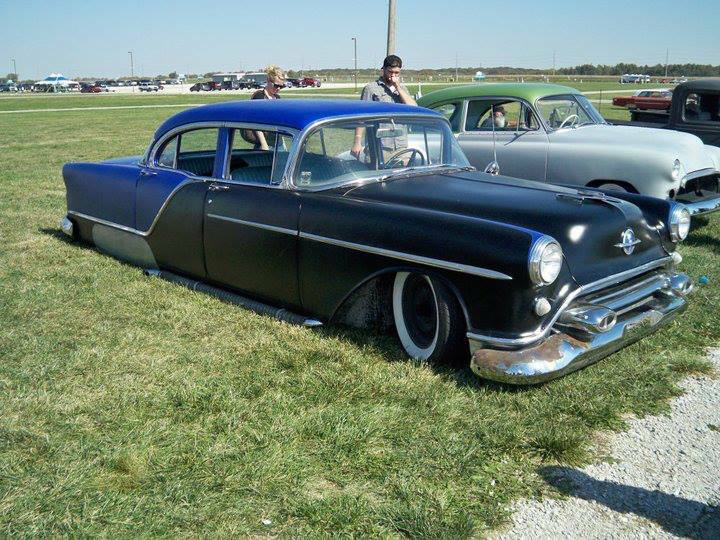 46 olds 2door torpedo back hot rod rat rod lead sled. This cars runs fast and loud. 350/350, Grand National coil over rear.Fulton visor, Britz aluminum bumpers. Power brakes. 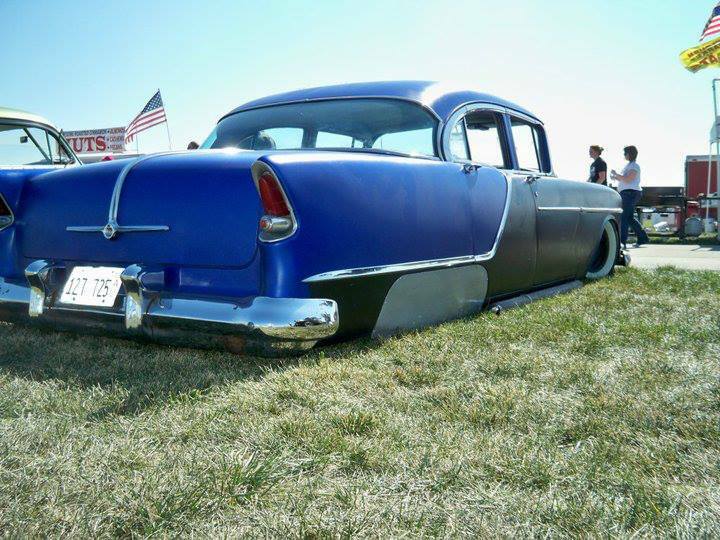 Original independent front suspension. 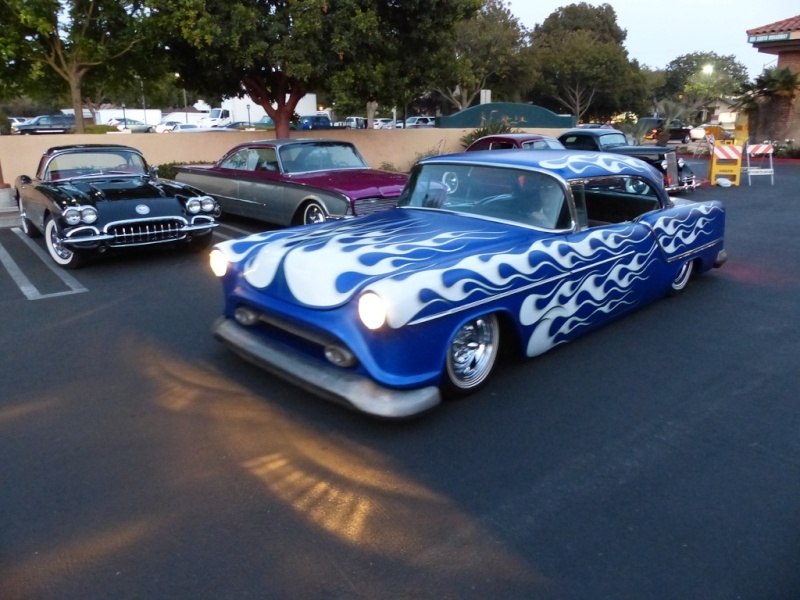 New tires(blackwalls but i have new mooneyes potawalls that will go with it) New cherry bombs and tail pipes.Car is registered and I drive it to cruise nights and shows. 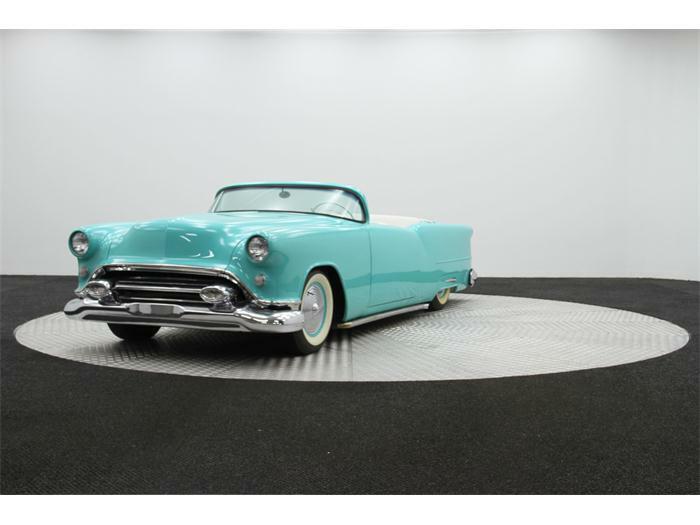 This fully transformed, resotred, and refurbished Gene Winfield inspired 1954 Oldsmobile Holiday Custom was acquired from the one and only BARRETT JACKSON and added to the personal collection of our CEO. 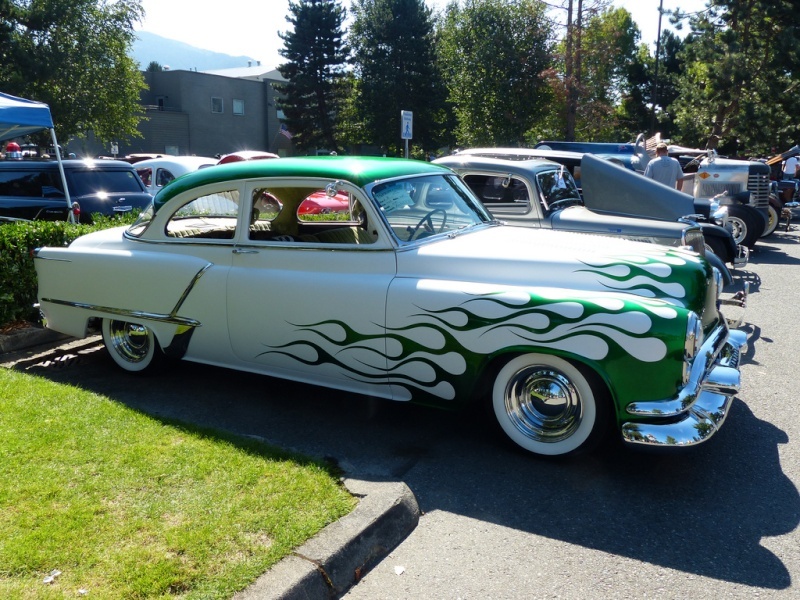 Since time of acquistion, the vehicle has been stored indoors, and only driven when taken to local car shows. 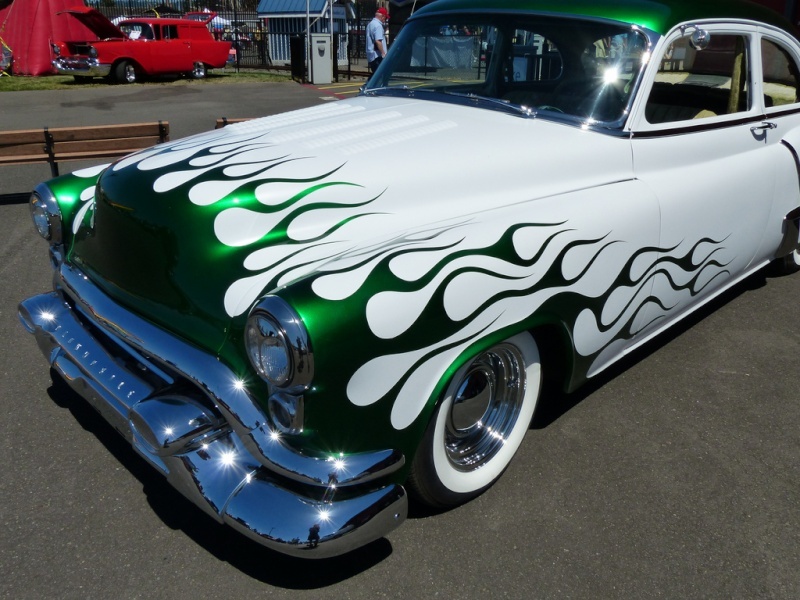 It is powered by a 350cid Chevrolet small block, a 350 Turbo automatic with a shift kit, 9" Mercury rear end with 3.00:1 gears, stock 11" drum brakes and Firestone air bags in the rear. 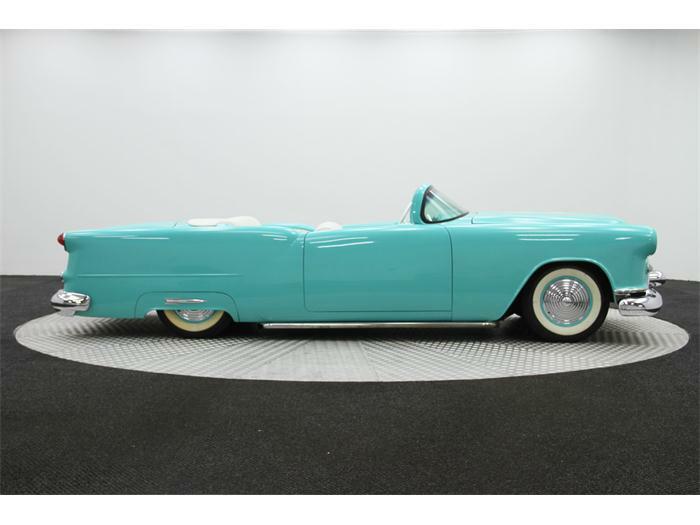 The body was transformed from its original hard top to its now unique roadster look. 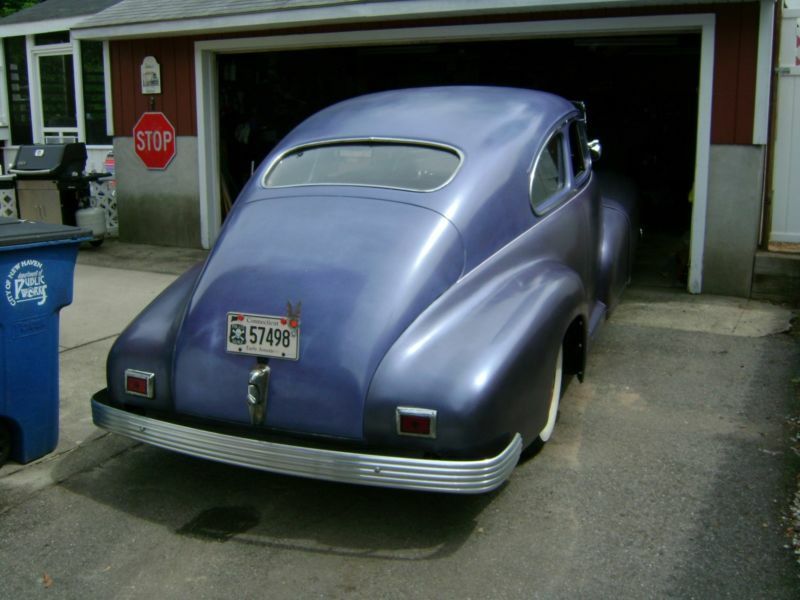 The windshield was chopped 4 1/2", window channels filled, all doors and panels shaved, and headlights frenched. The interior and exterior are completely flawless. The engine fires up immediately and runs strong. 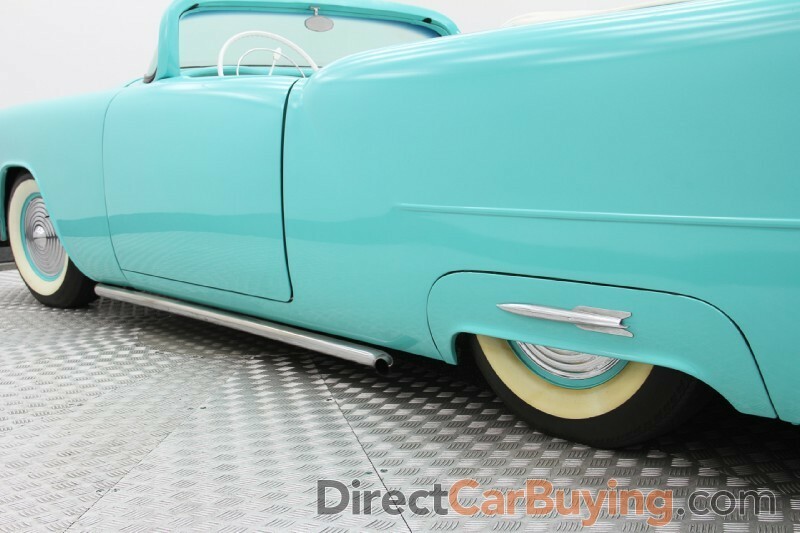 Fully operable air suspension makes this roadster a true attention grabber! No top or side windows. 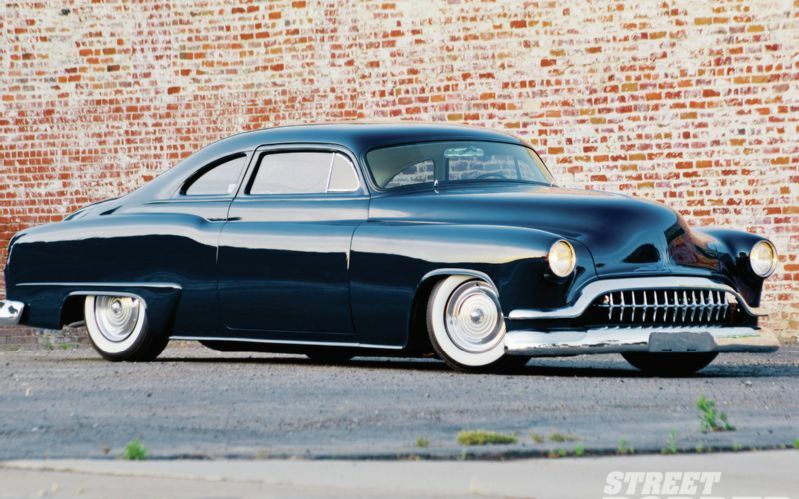 Like most people who’ve seen Jared Roethlisberger’s ’51 Olds in person, STREET RODDER’s first look at the car was at the 2011 Grand National Roadster Show where the custom made its debut. Jared grew up in a family of automotive enthusiasts, watching his uncle work on cars as a mechanic and listening to his mom’s stories about her Corvette and ’69 Cougar XR7, and his dad’s stories of racing on various Southern California dragstrips. His own taste leans toward customs. 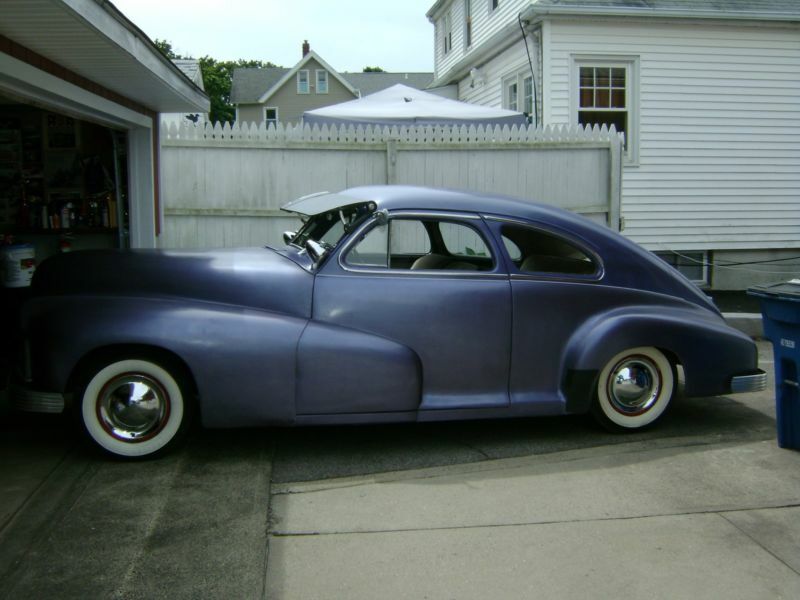 He started working on his first car, a ’41 Plymouth sedan, when he was still in high school. 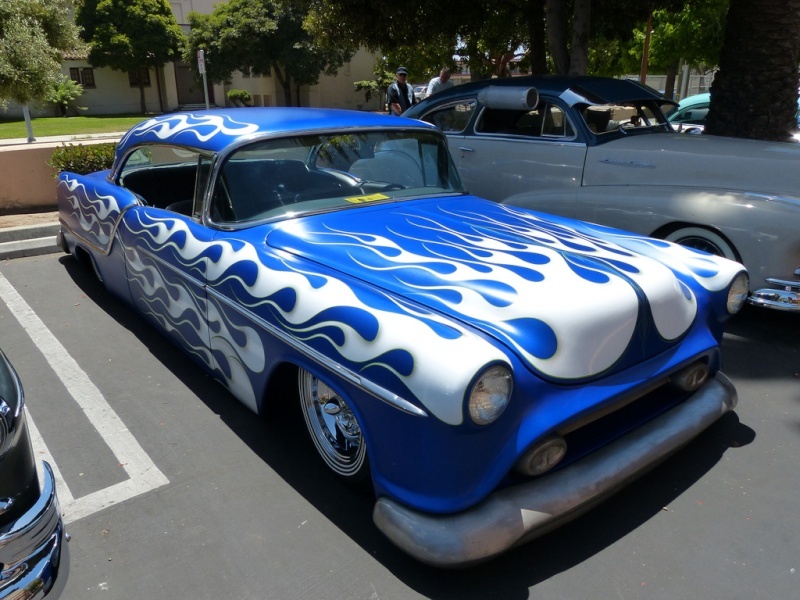 The Olds went to Highway 99 Hot Rods in Visalia, California, for the build. “It was obviously someone’s abandoned project,” Don Dillard, owner of Highway 99, says. “The drivetrain was missing, there was no interior, and everything that was there was apart and thrown in the inside of the car. The body modifications had been started, but not finished and what was done, was done poorly. But there was no evidence of any collision or rust damage. It was a very solid car before someone started hacking on it. “At first, Jared told me he wanted it bagged. 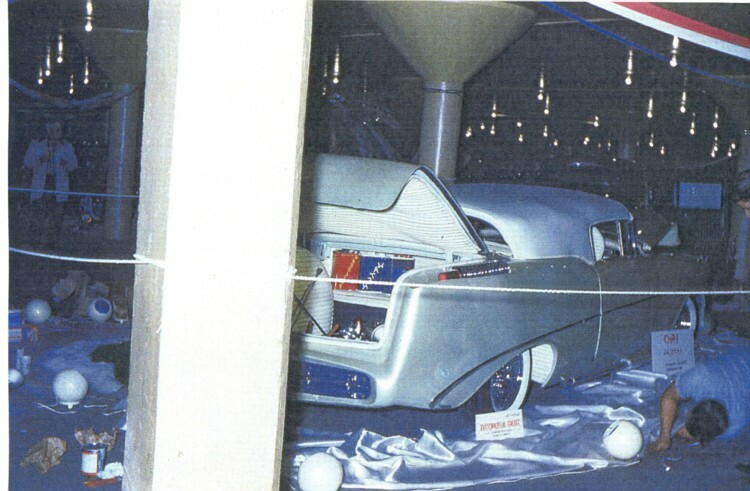 I said it needed a whole lot more than bags and proceeded to rattle off a list of things that would be included in a groundup build.” The front suspension was replaced with a GM G-body (’78-87 Monte Carlo, Cutlass, Gran Prix) front clip—and substituted the front spindles, rotors, and calipers for those from the same year Cadillac, giving up 12-inch disc brakes. The airbags are a RideTech kit for G-bodies. 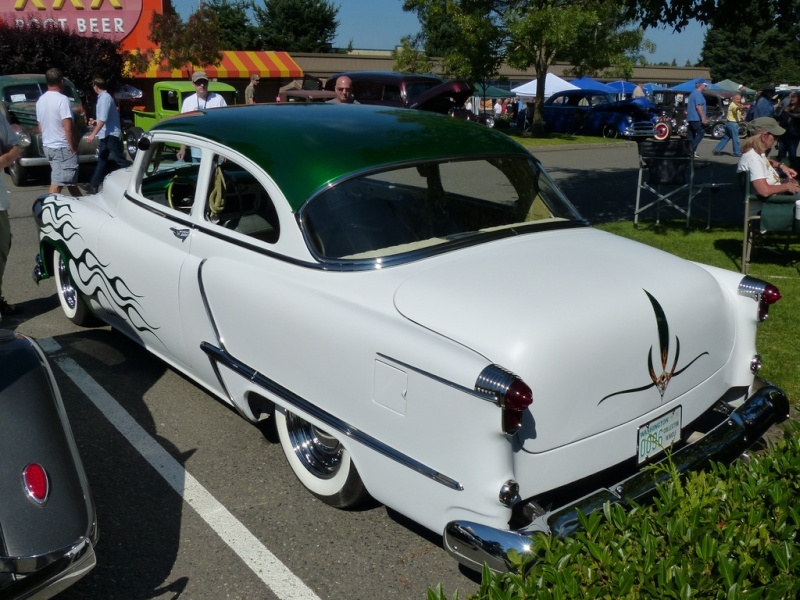 Highway 99 eliminated the original semi-elliptic leafs in the rear but kept the stock axle, and added a custom triangulated four-link and custom brackets for the RideTech airbags. Once all the frame mods were completed the entire chassis was blasted and powdercoated. 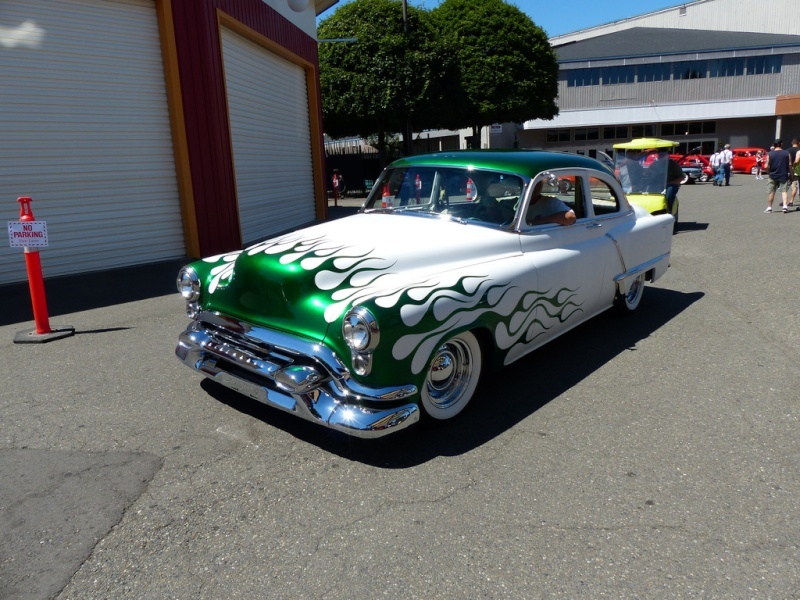 Jared supplied the rebuilt Chevy 350, running an aluminum dual-plane intake with a 650-cfm Edelbrock carb, a Technostalgia Caddy-style air cleaner, finned aluminum valve covers, coated blockhugger headers, and Bill’s Hot Rod Company brackets. A GM HEI ignition provides spark. TRC in Visalia rebuilt a TH350 transmission for the car. 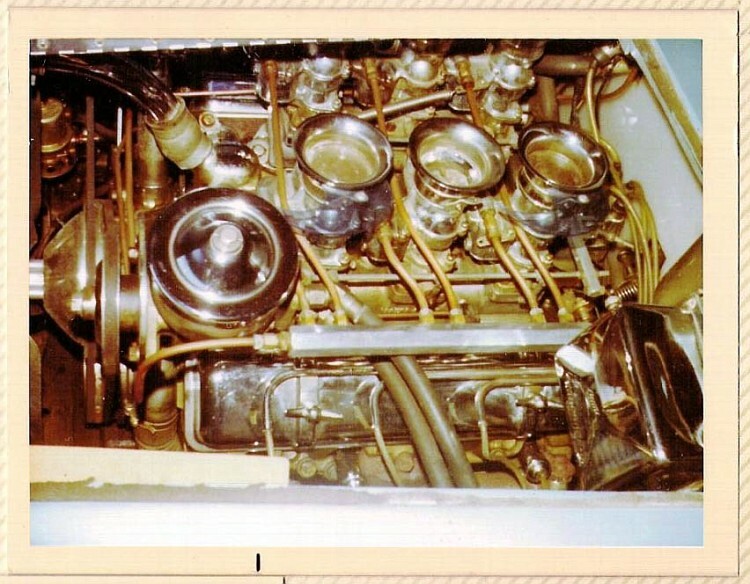 Rather than use the factory G-body mounting location, the engine and trans were mounted lower in the chassis to allow the custom driveshaft, built by McAllister’s in Visalia, to line up with the X-member in the center of the frame. 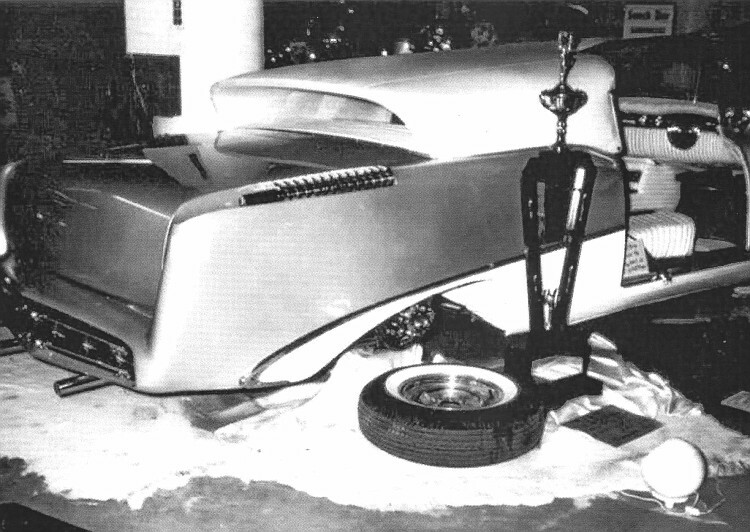 The bodywork was the most time-consuming portion of the build, due to the sad condition of the car. The top chop was unfinished, but it was straight and didn’t need re-cutting. Filler work was redone on the top, the windows, doors, and garnish moldings were refinished. All of the trim had been removed from the car and most of the holes welded up. 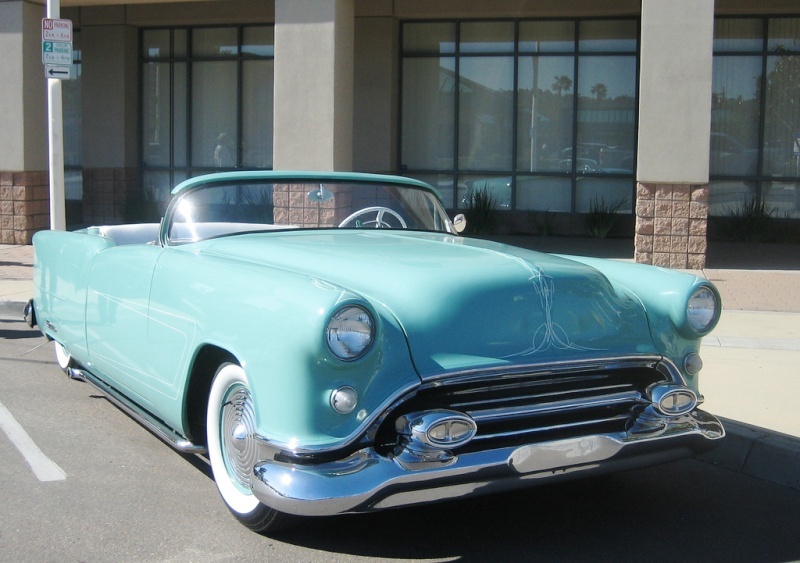 The hood and front fenders were modified with a curved lip where they meet the upper grille bar. 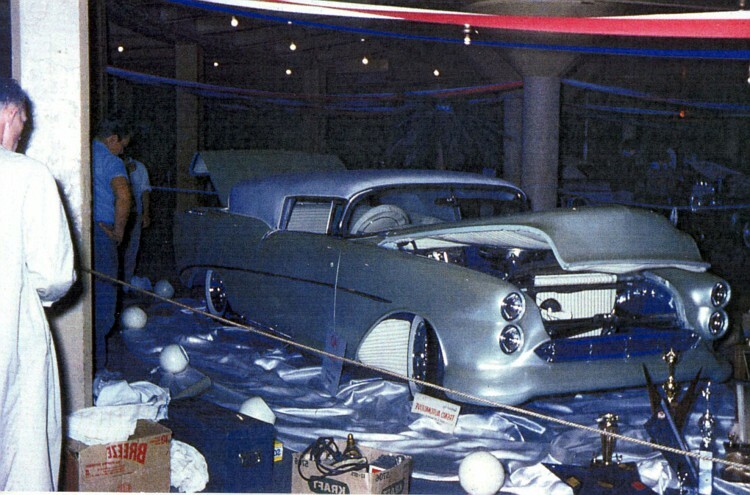 The ’57 Corvette grille came from Night Prowler’s Customs; front turn signals were mounted behind the teeth. 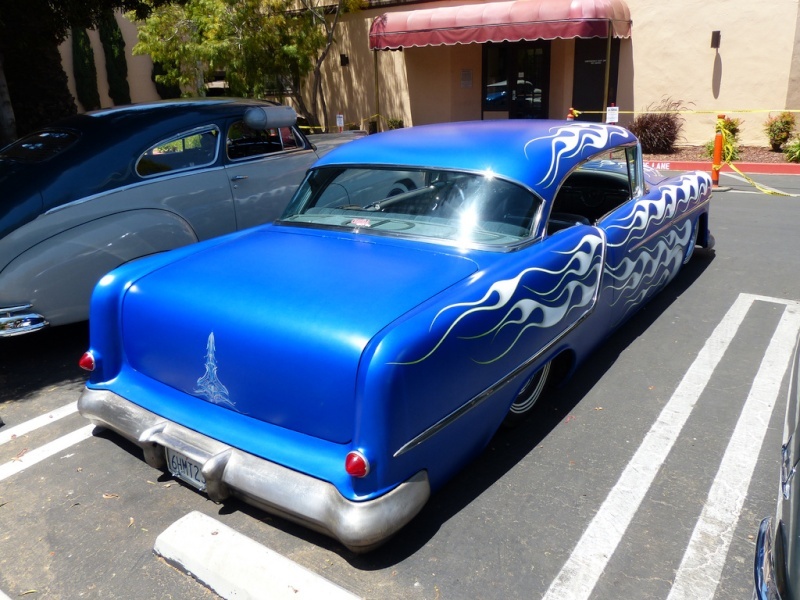 Both bumpers were reshaped and then sent to Meclec in Fresno for fresh chrome. 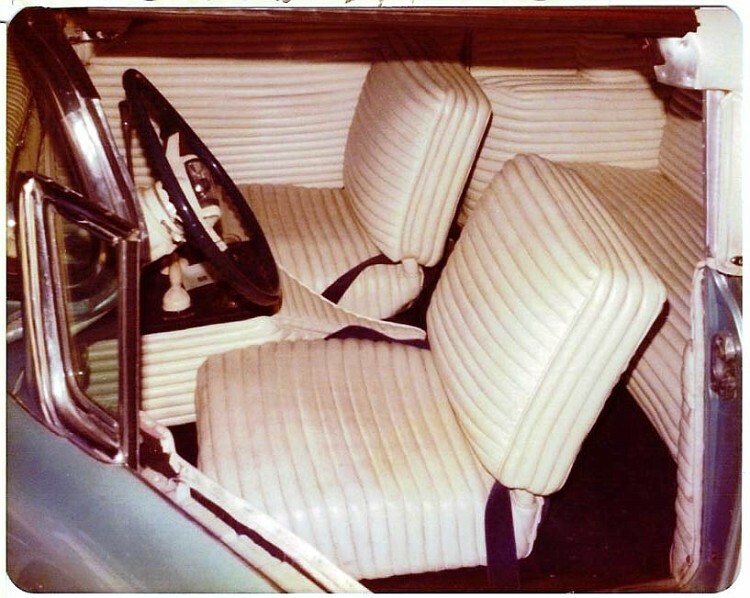 The doorjambs were reshaped to accommodate solenoid-activated bear claw latches, and the roof was rounded at the upper corners of the windshield. 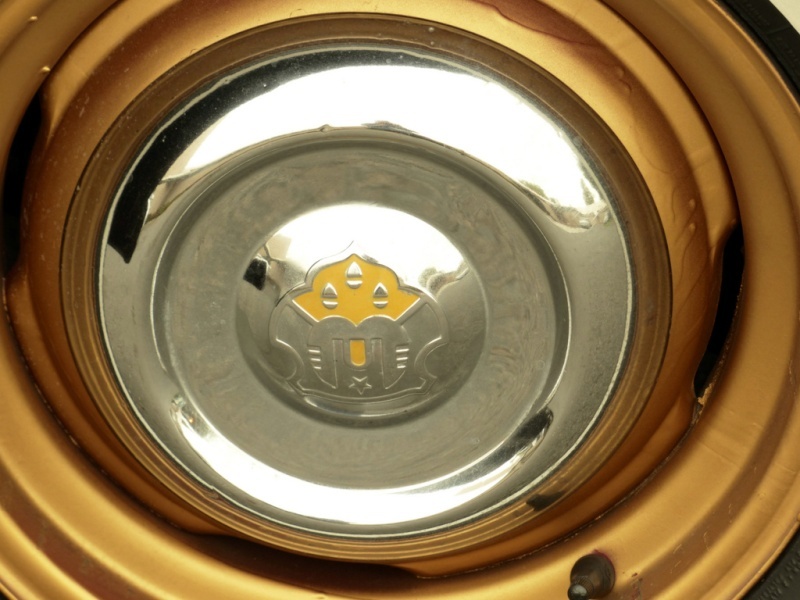 The ’54 Ford headlight was partly installed; Dillard finished welding them and filled the holes below the headlights. 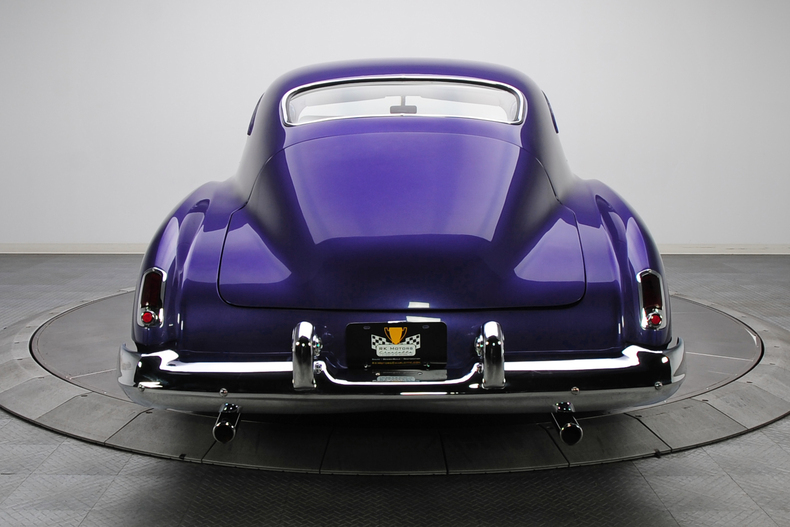 The stock taillights were replaced with ’54 Merc lenses. See page 58 for tech details on the taillight installation. 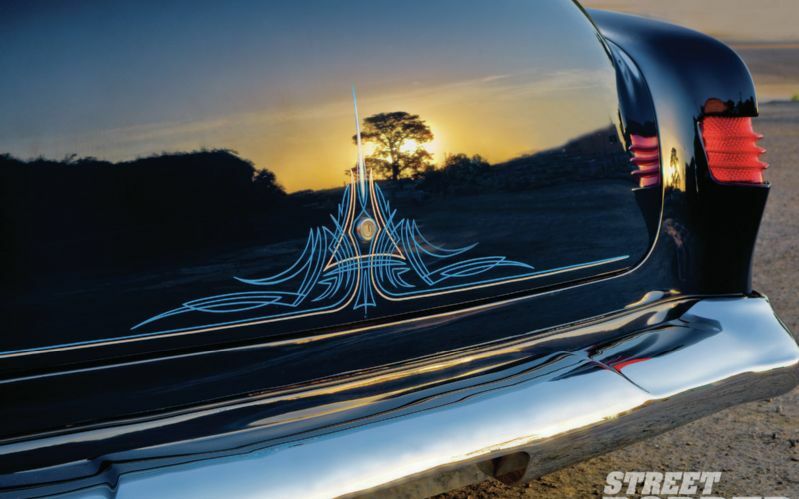 Ruben Holguin kept his brushes busy, adding pinstriping all over the Olds. 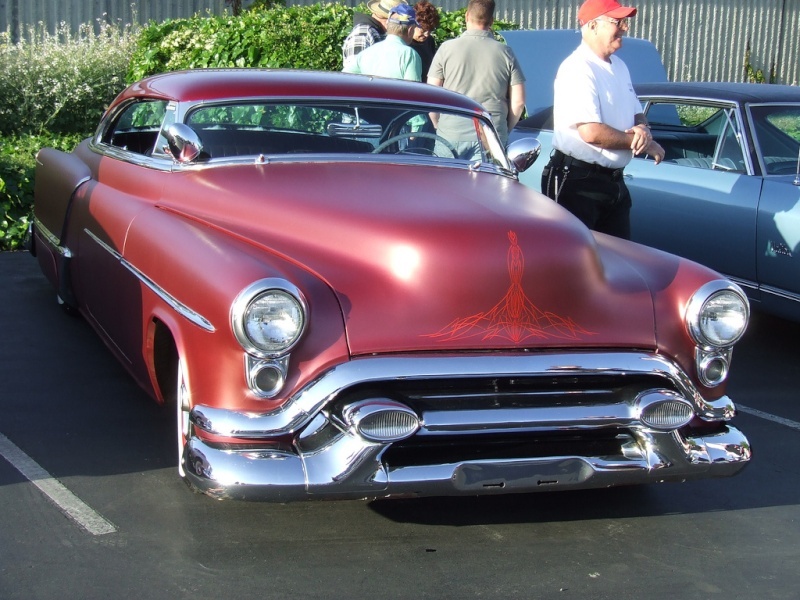 Although Jared envisioned the Olds with satin paint, Dillard convinced him that the amount of bodywork that he was doing on the car deserved a shiny finish. Jared’s choice of blue is a Laidlaw Trucking fleet color. 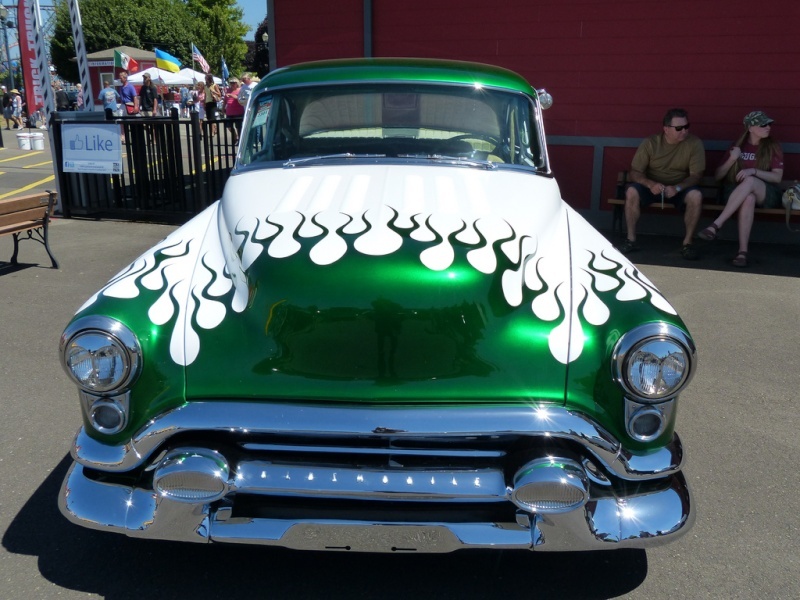 “Rotten” Rodney Bauman did the filler work, aligning the panels, and shot and buffed the paint. 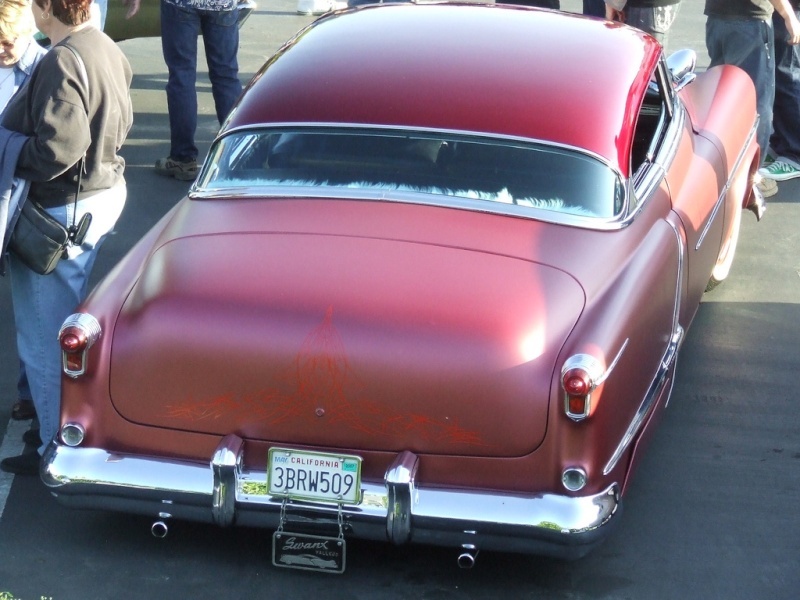 The Olds rolls on P205/75R15 Diamondback radials from the Whitewall Candy Store in Orange, California. 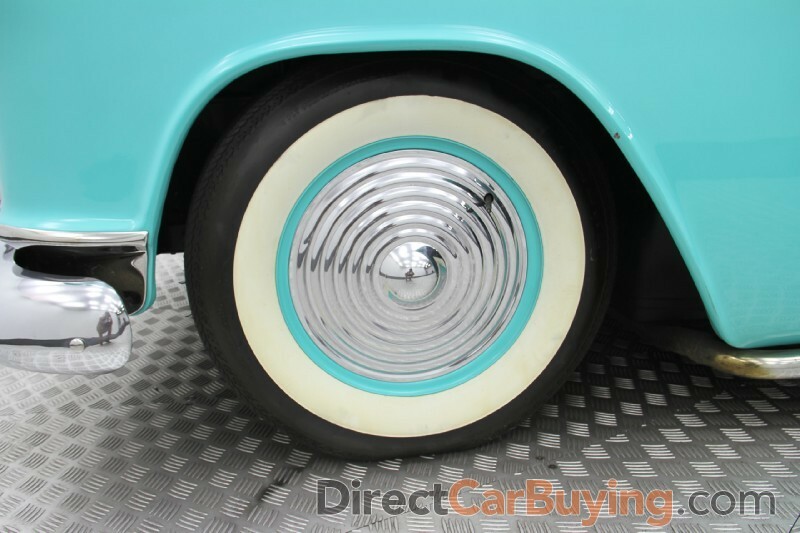 The 15x7 Wheel Vintiques steelies wear ’54 Olds wheel covers. 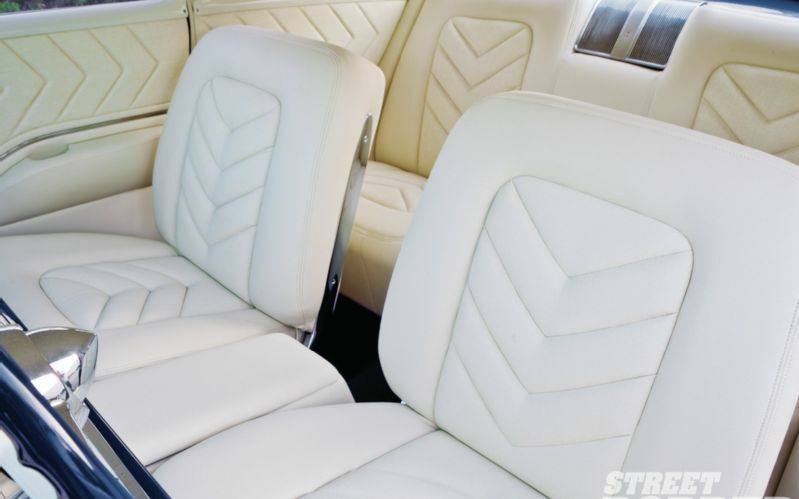 The interior is appointed with mid-’60s GM bucket seats in front and mid-’60s Cadillac seats in the back, upholstered by David Galindo at House of Trim in Paramount, California. 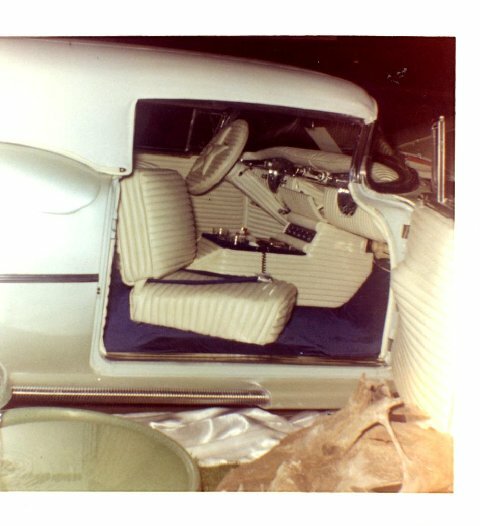 The stock dash and instruments were kept and the original clock pod was reworked to house the gauge for the front airbags. 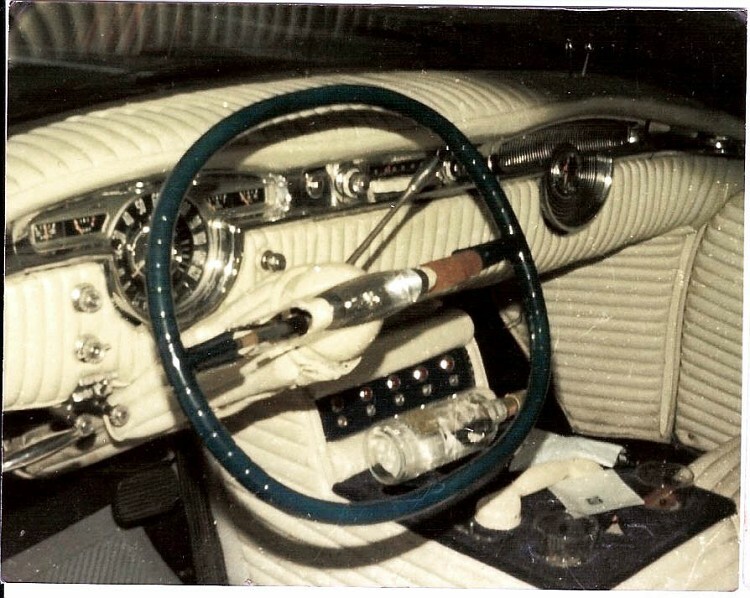 Airbag switches were located in the original air vent lever locations. Instead of a stereo head unit, the Olds features iPod jacks in the center console, plus a Kenwood amp, Clarion equalizer/crossover, and front and rear Pioneer speakers. 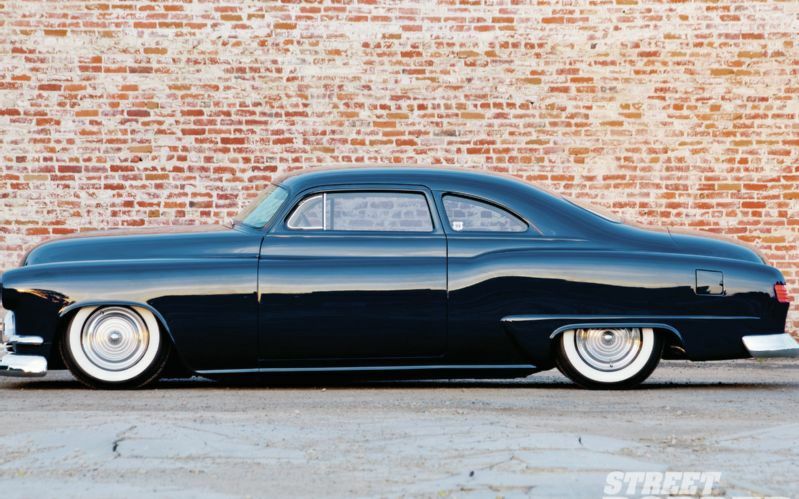 His patience paid off when he was able to enter his ’51 Olds in the Grand National Roadster Show in Pomona last January. 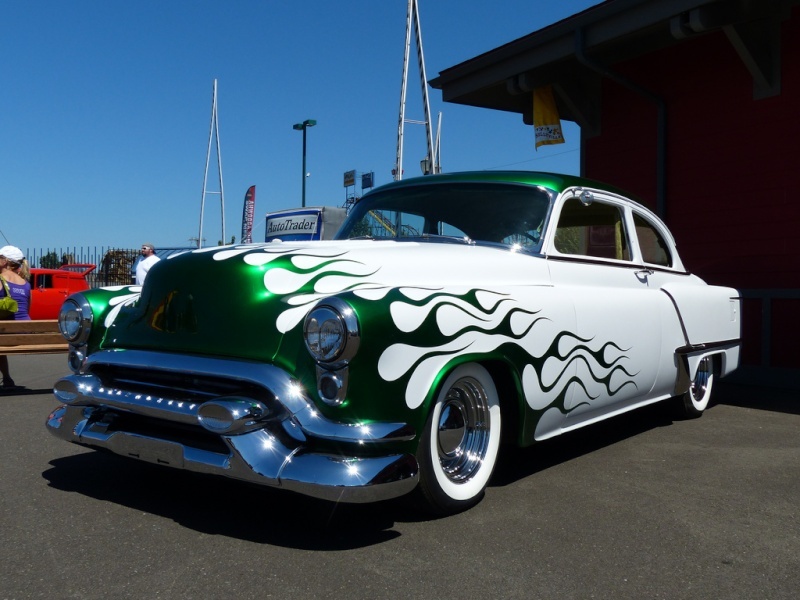 It can be an intimidating feeling to see your own car on public display amid hundreds of the country’s best, and an exhilarating feeling to realize it belongs there. 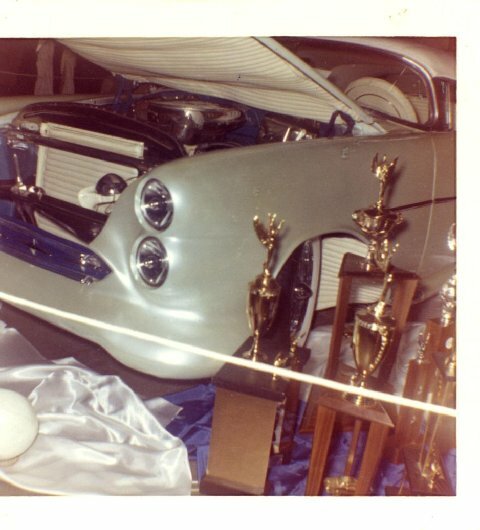 A lot of us guys (especially those of us who grew up in colder climes) cut a hot rod tooth attending indoor winter cars shows as youngsters. 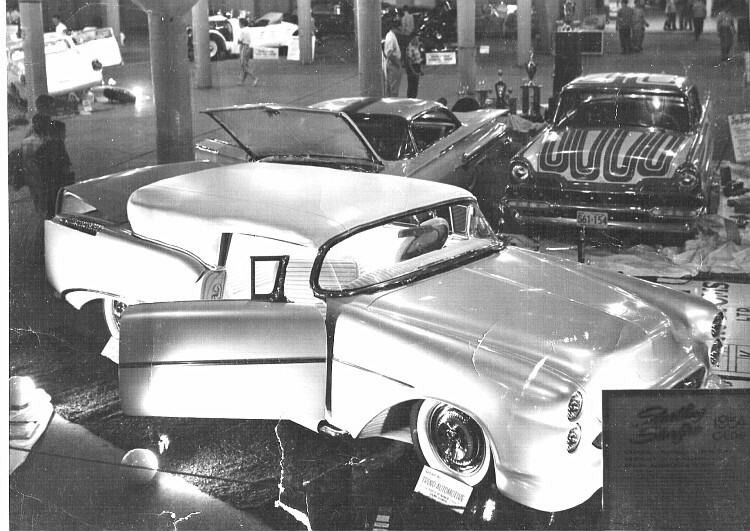 Cool customs, hot rods, and mounds of angel hair all crammed into the confines of our local armory or exhibition hall went a long way in shaping our attitudes and preferences. 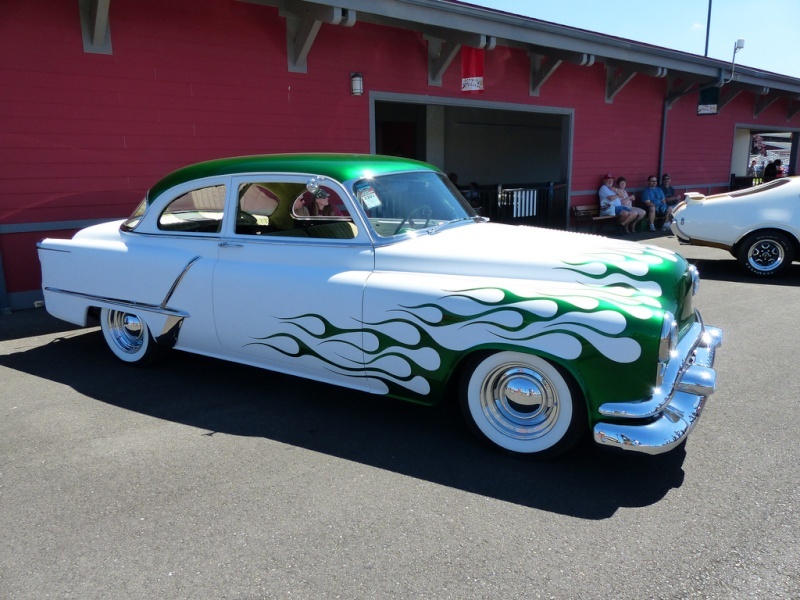 A perfect case in point is Albert Torelli's awesome '49 Olds Club Sedan, which we had the good fortune of running across at the Goodguys show in Pocono, Pennsylvania, recently. Albert had the good fortune of growing up surrounded by cars of all makes and models. You see, his dad owned and operated a service station and Albert spent much of his youth pumping gas and wiping windows. Spending his formative years in such a situation pretty near guaranteed he'd grow up to be a car guy, especially when as a treat he'd attend as many local indoor custom car shows as he could. 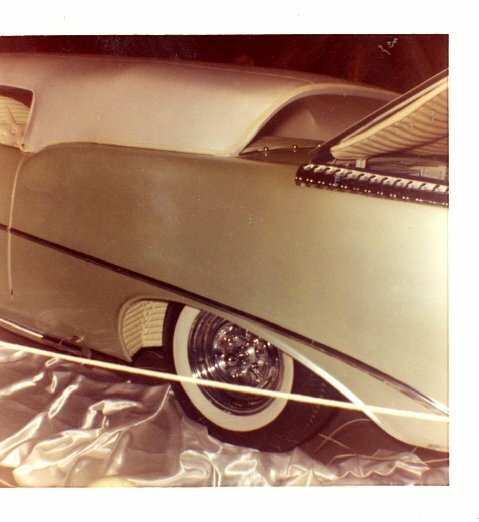 Albert loved 'em all-both hot rods and customs, but always had a soft spot for the swoopy lines of early Oldsmobiles and knew that someday he'd have one of his own. 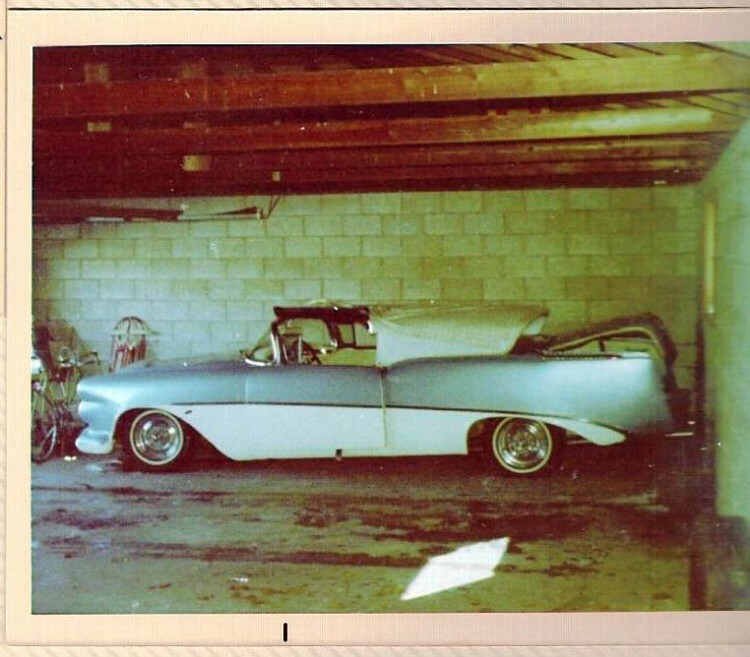 Well, time passed and wouldn't you know it, he did end up with an Olds-a perfectly restored bone-stock '50. 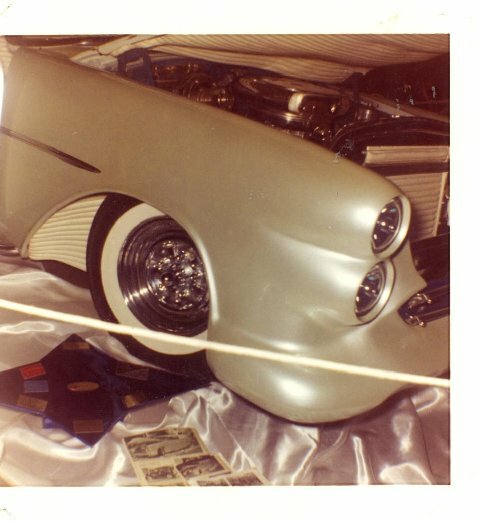 And though he loved it, he still had a longing for a cool custom rod like those he'd admired at the Philly car shows of his youth. 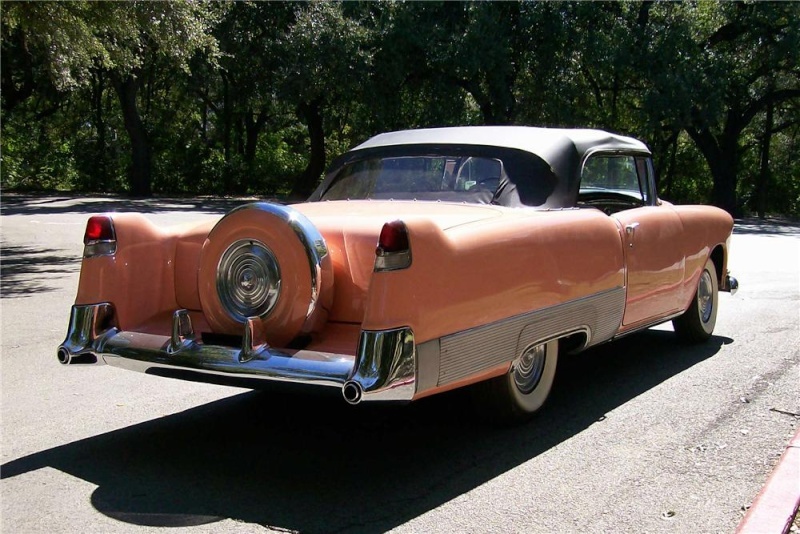 Well, about eight years or so ago he happened across a '48 Olds Club Sedan (three blocks from home, no less) and bought it without hesitation. This one was destined to be the custom rod he'd dreamed about in his youth. 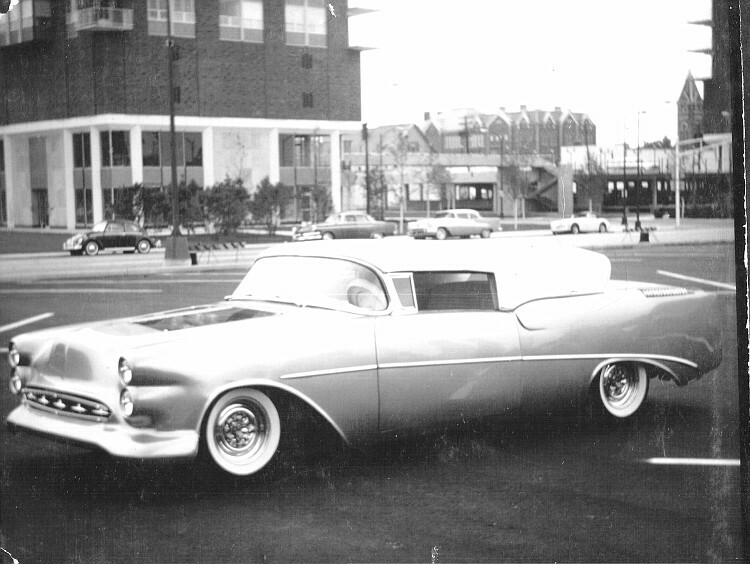 He'd for years thought about building his version of an Olds-much like GM would have built an early concept car-low, long, and classy, with a large dose of muscle as well. 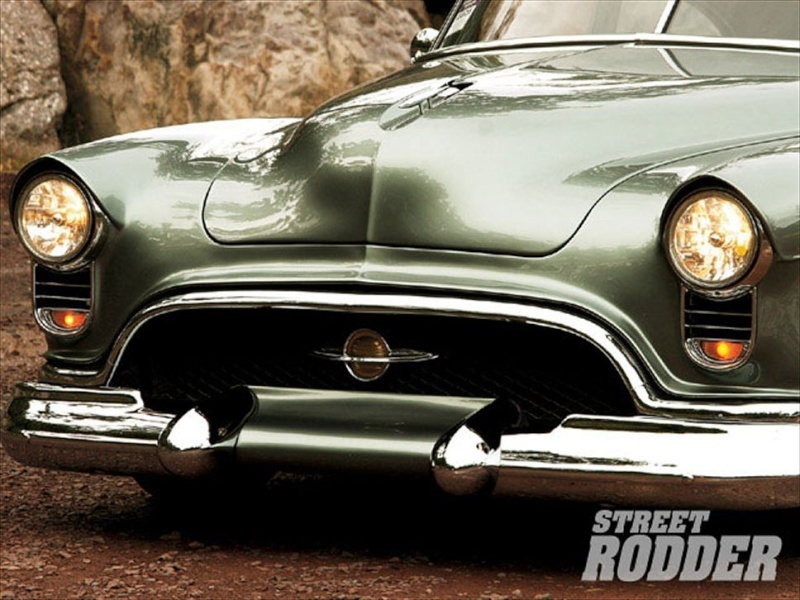 A muscular Chevrolet ZZ3 small block backed by a 700-R4 and a Ford 9-inch powers the Olds and provides a perfect combination for carefree custom cruising. 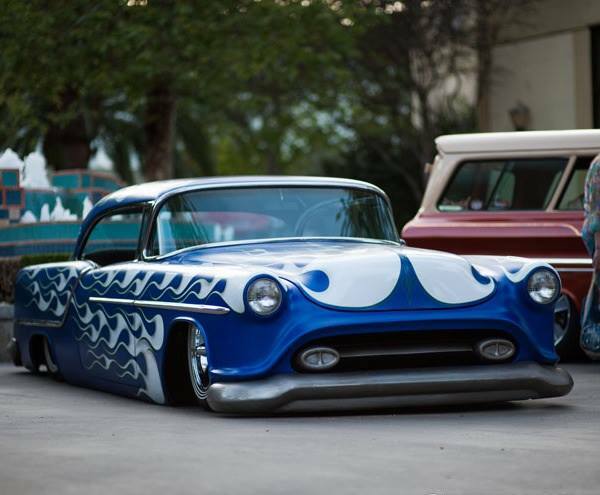 A muscular Chevrolet ZZ3 small block backed by a 700-R4 and a Ford 9-inch powers the Olds Albert started the rebuild by having Fat Man fabrications build and install a custom front frame clip complete with Mustang-II IFS and disc brakes. 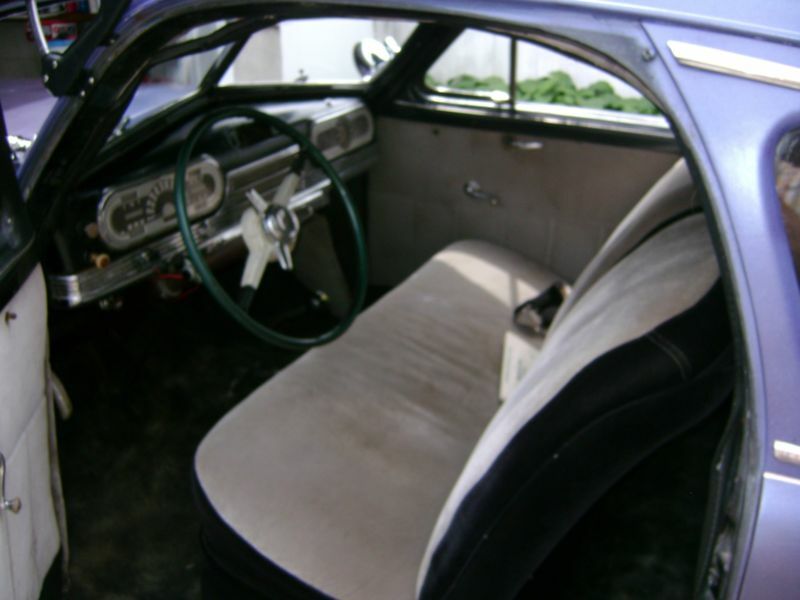 To that he added a Mustang 9-inch rear and Air Ride Technologies air bags at all four corners. A 355ci Chevrolet ZZ3 backed by a 700-R4, a custom drive shaft, and a quartet of wide-whites were added to the mix as well. 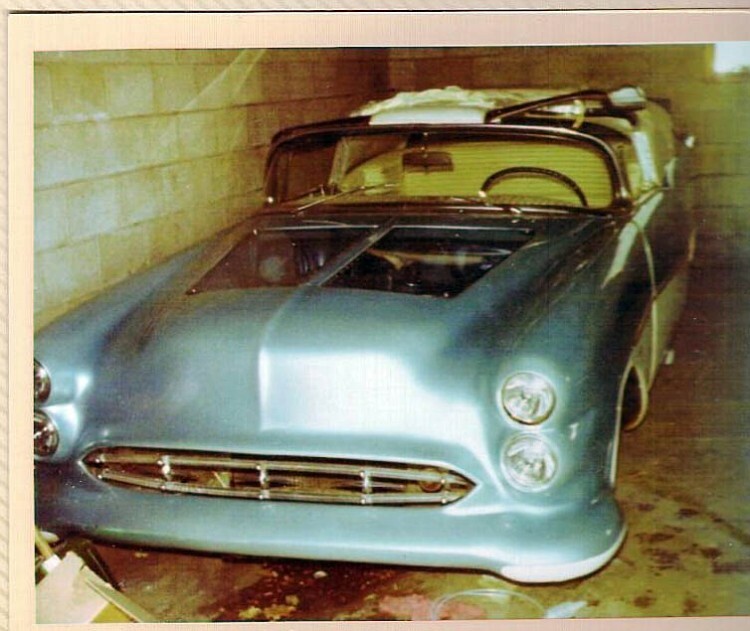 With the foundation under control, the next step was the bodywork. Albert had a specific vision, and his metal men didn't let him down. Dan Meyers whacked a good three inches out of the top, sinking the windshield and leaning it back five degrees. 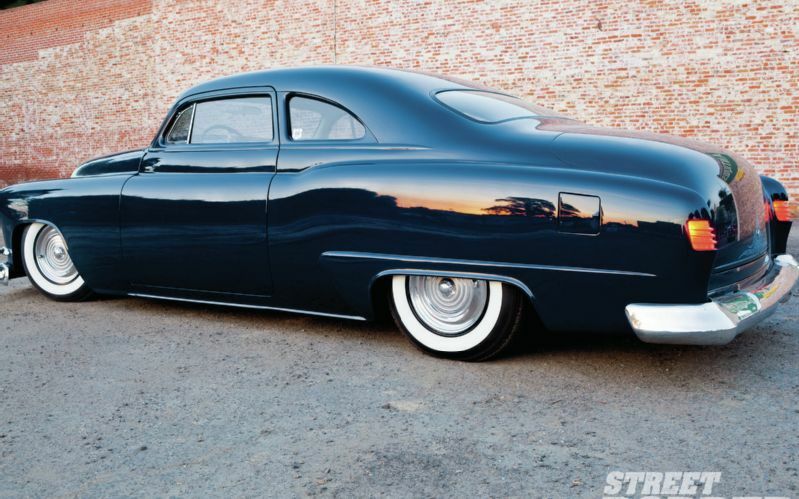 He also extended the quarter panels 8-inches, pie-cut the hood 2 1/2-inches, fabbed a set of eyebrows over the headlights, shaved the door handles, and hand-formed a pair of flush-fit rear skirts out of a '58 Caddy roof panel. 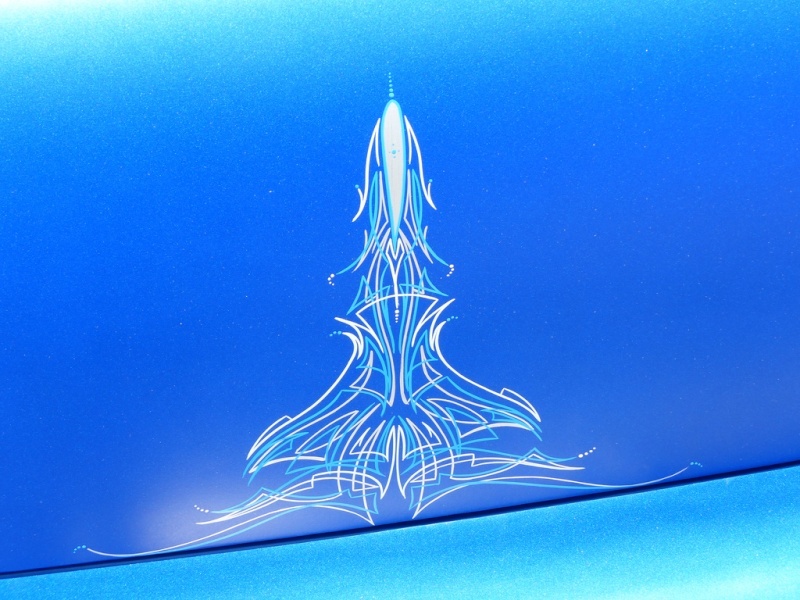 While he was at it Dan added a hand-formed rocket on the decklid and reshaped the front wheel openings too. 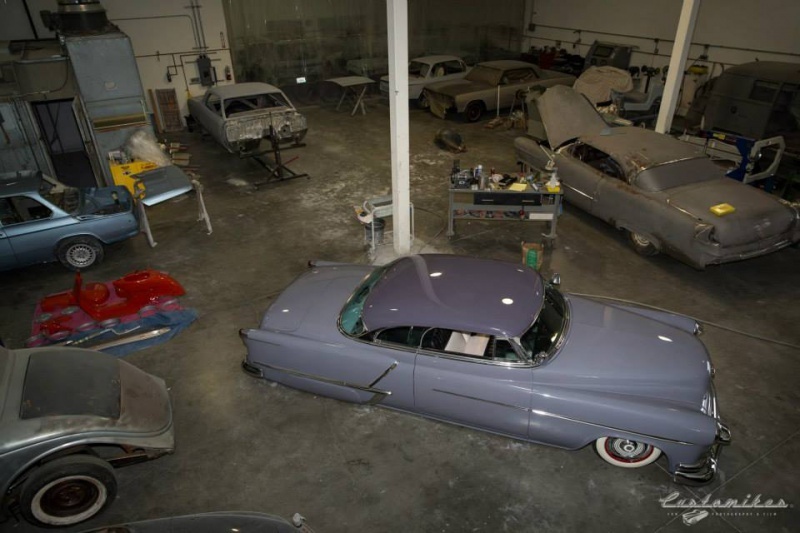 With the metalwork complete, Jimmy Hines prepped the metal for paint and Chris Judeikis laid down a glass smooth coating of Nissan Green PPG urethane. With the custom body work and fresh paint complete, the next step was a bit of brightwork. 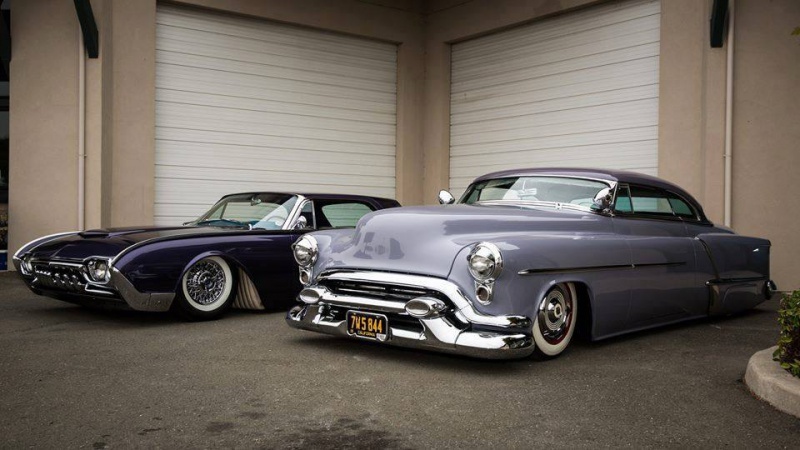 A split Olds front bumper and a pair of Merc Dagmar's were hung up front and a '53 Olds grille bar was used as a rear bumper. The interior experienced quite a makeover as well. 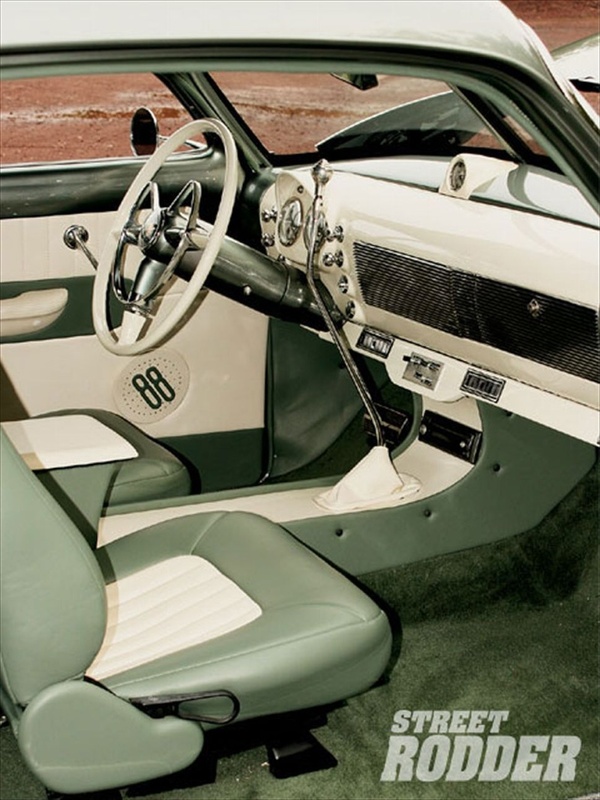 The dash was fitted with a custom Dan Meyers insert and Classic Instruments gauges, a set of '92 Olds seats were chosen, and a complete custom upholstery job was stitched by Bob Sapp in Mystic Green and Cream Ultra leather. 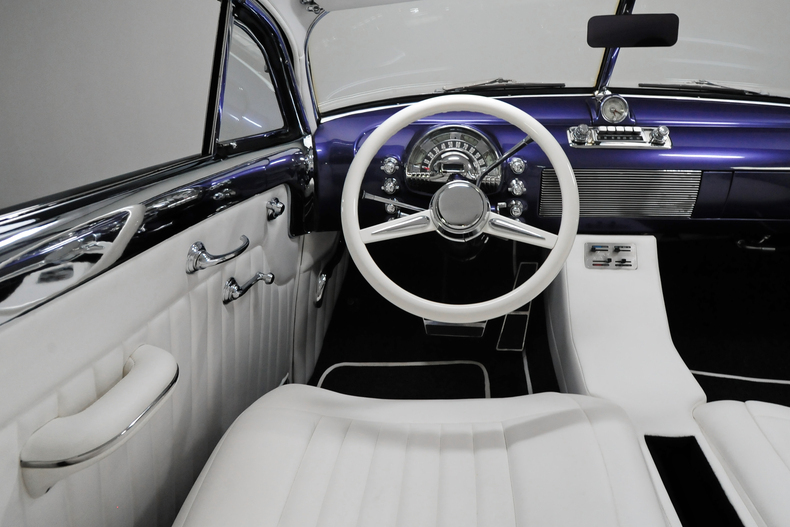 Vintage air conditioning and a top of the line Kenwood stereo system capped the interior upgrade. 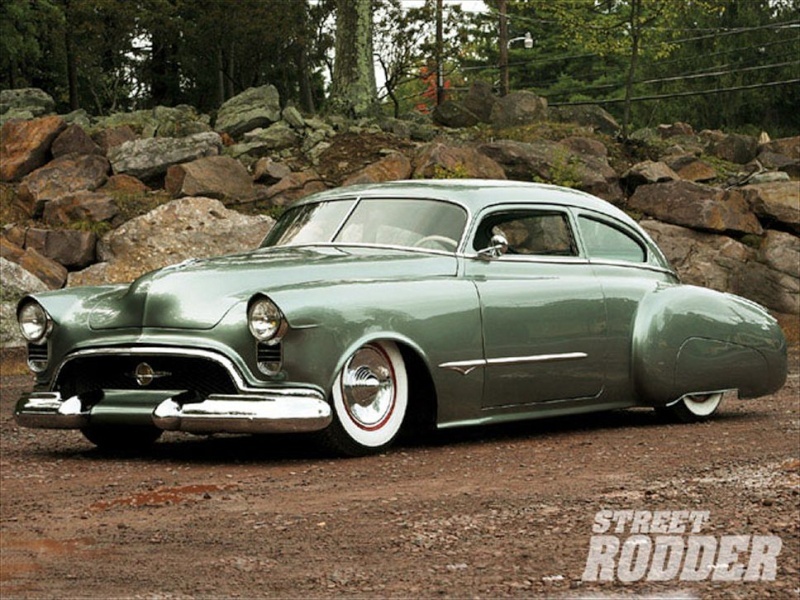 You've got to admit, Albert's concept together with the talents of all involved has produced one heck of a cool custom rod-and we're more than happy to be able to share it with our readers. 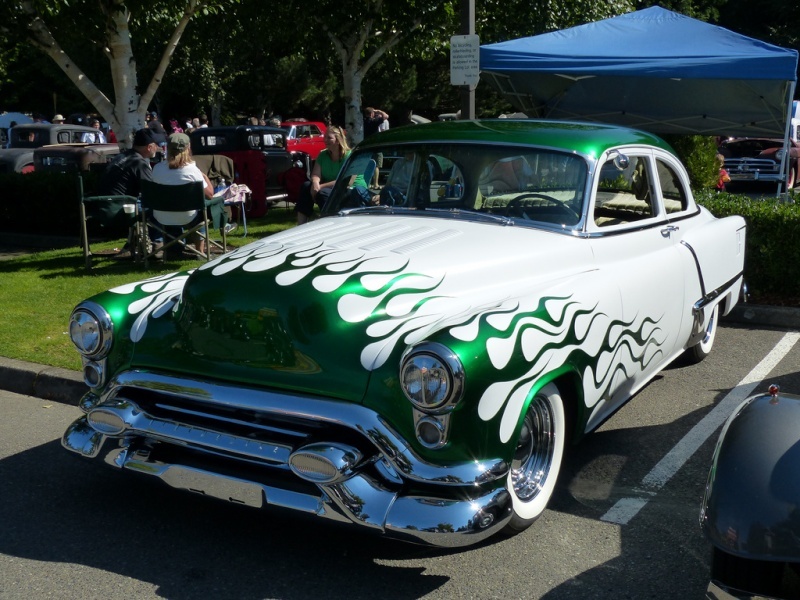 Keep your eyes peeled for this baby as Albert's planning on driving to as many regional hot rod gatherings as he can! 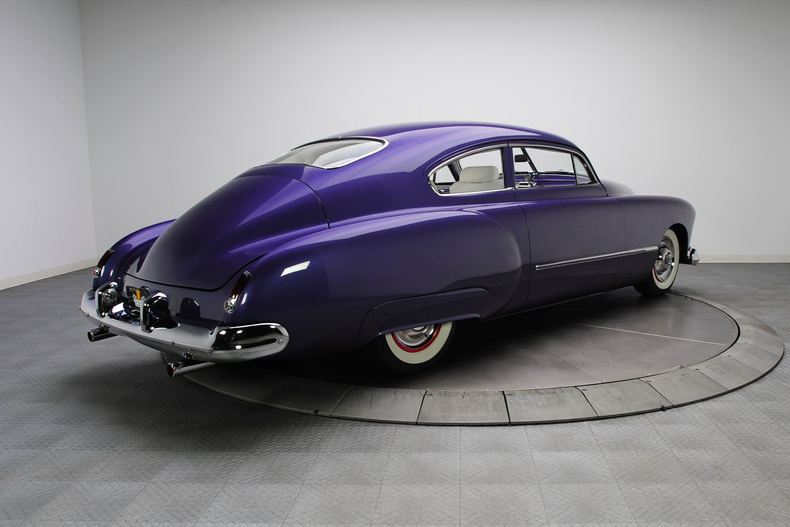 Here you can see how well the stock taillights (with glass '48 lenses) work with the extended quarters, custom decklid metalwork, and the '53 Olds grille bar turned bumper; it's quite obvious that Albert and the guys made each and every custom touch compliment each other-a sure sign of a successful build. 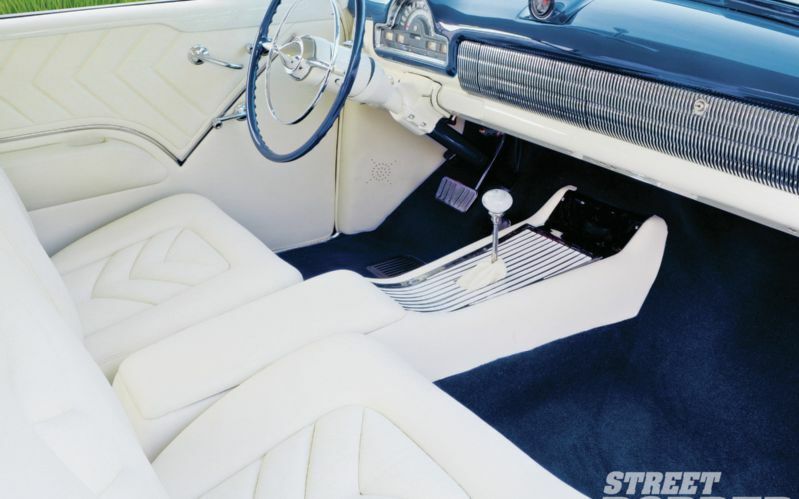 The Oldsmobile's interior has received every bit as much attention to detail as has the exterior and driveline. 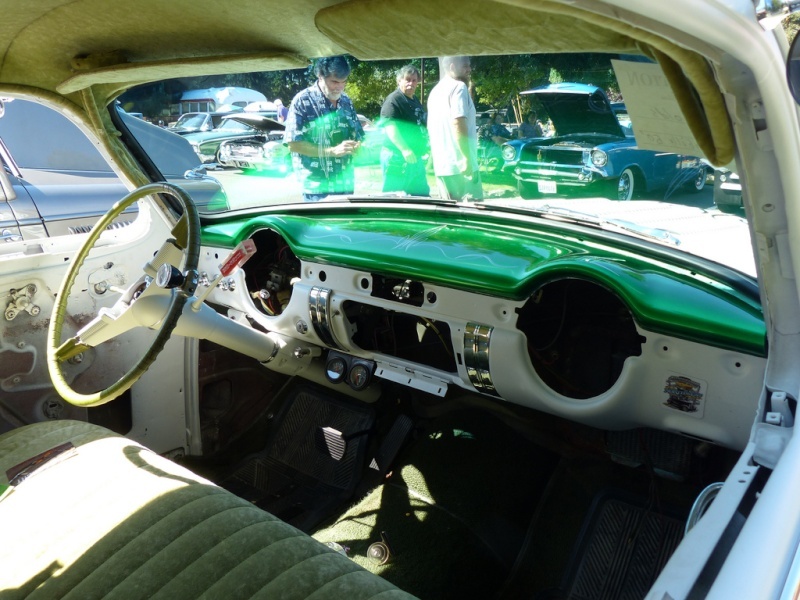 Bob Sapp stitched up an extremely impressive Ultra Leather interior in Mystic Green and Cream. 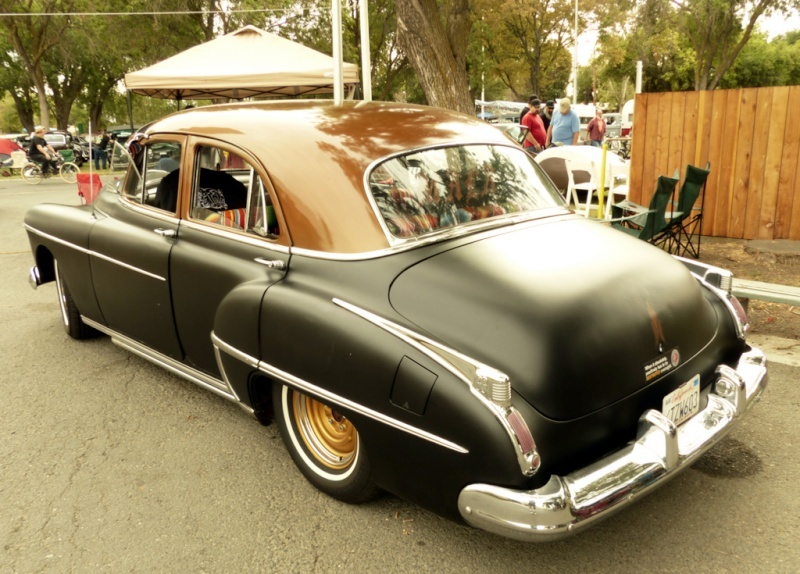 Here you can see how well the stock taillights (with glass '48 lenses) work with the exten The custom metal work on Albert's Olds is astounding: everywhere you look you'll find obvious mods and countless subtle ones, as well. 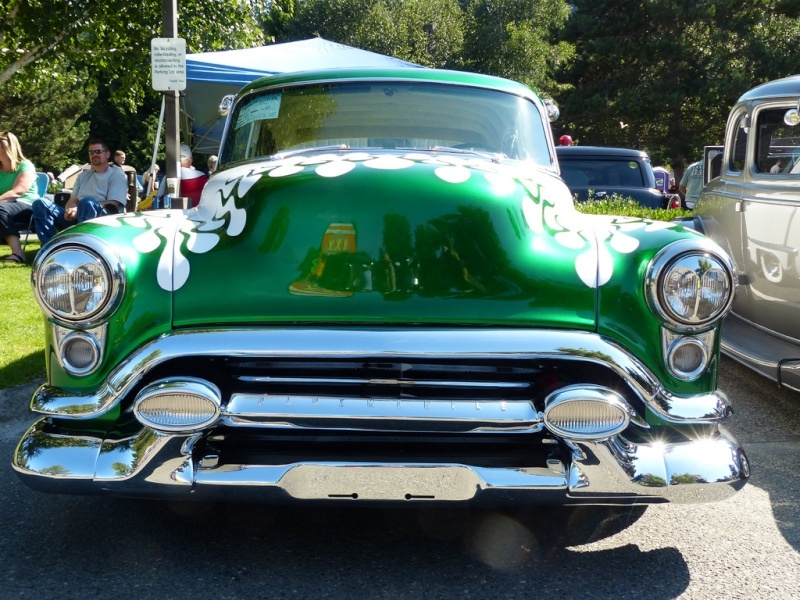 We love the split bar and Dagmar's as well as the cool headlight eyebrows and floating grille emblem. 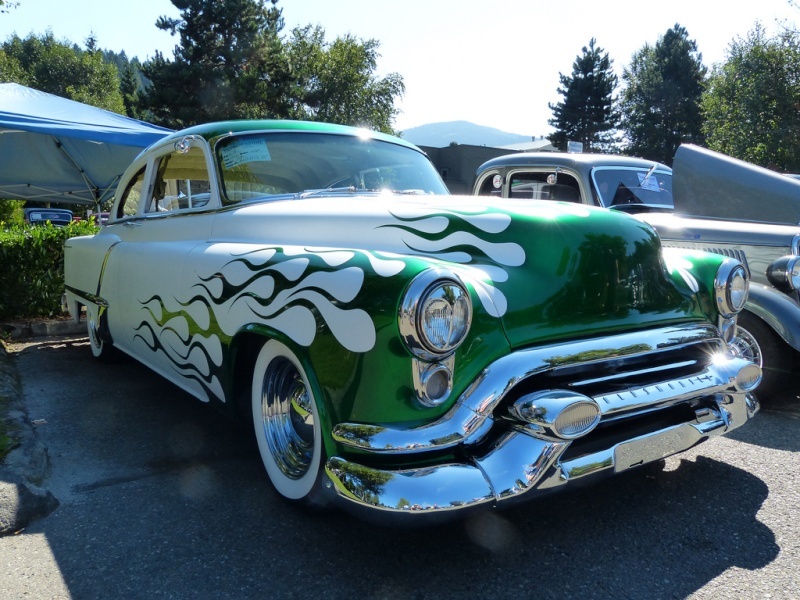 The custom metal work on Albert's Olds is astounding: everywhere you look you'll find obvi The Olds' fastback styling works well with the car's extended quarters and '53 Olds grille bar turned rear bumper. 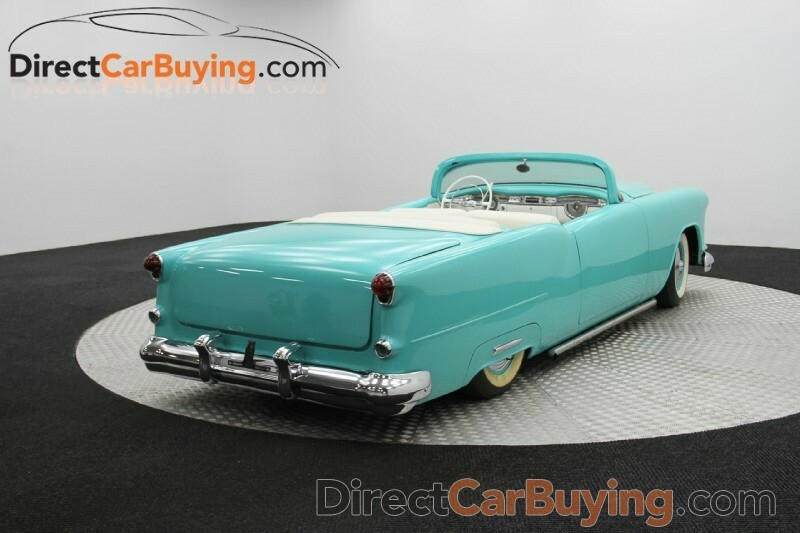 Those flush-fit skirts made from a '58 Caddy roof look perfect too. Metal man Dan Meyers did a fine job on this baby, as did all involved. 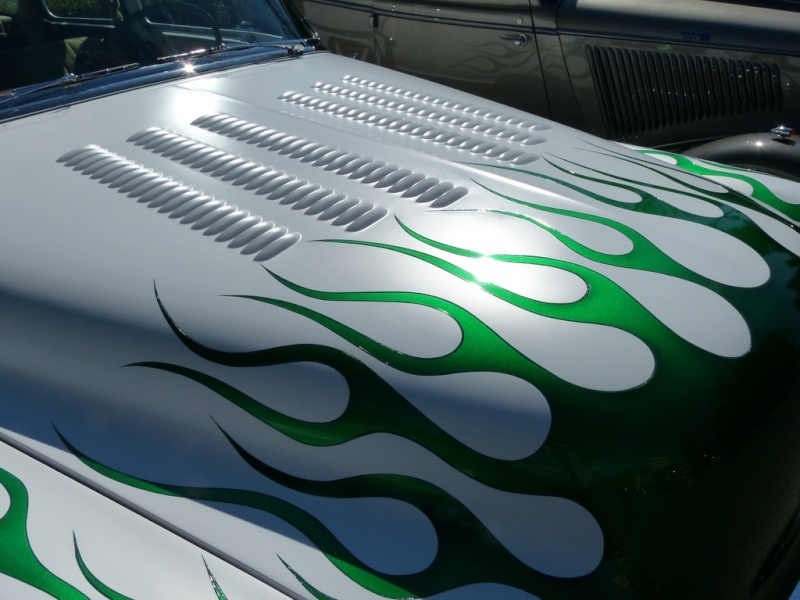 Hood Pie cut 2 ½"
One of the great things about building custom cars is just how many possibilities exist for a blank sheet metal canvas. 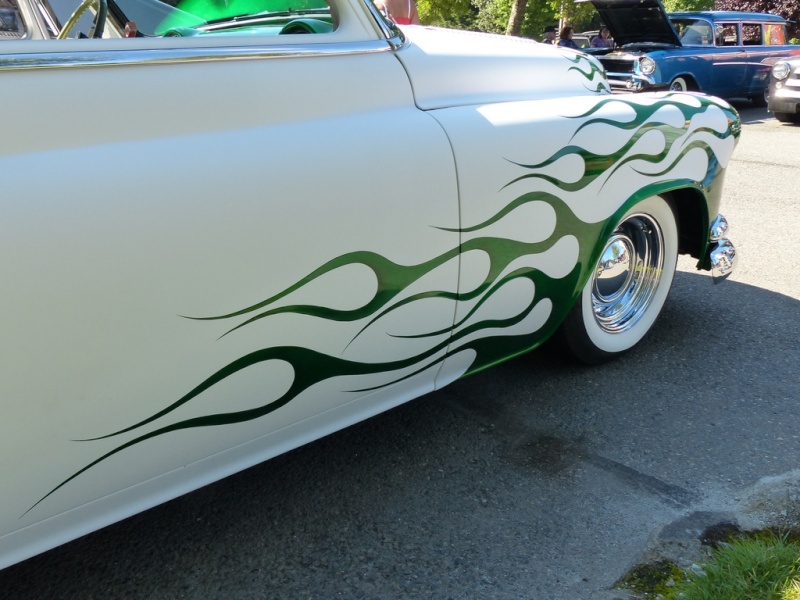 Some folks take the wild path with custom graphics, retina-scorching colors and huge motors poking through the hood. Others take subtle route, performing modifications that could be mistaken as OEM work to the untrained eye. 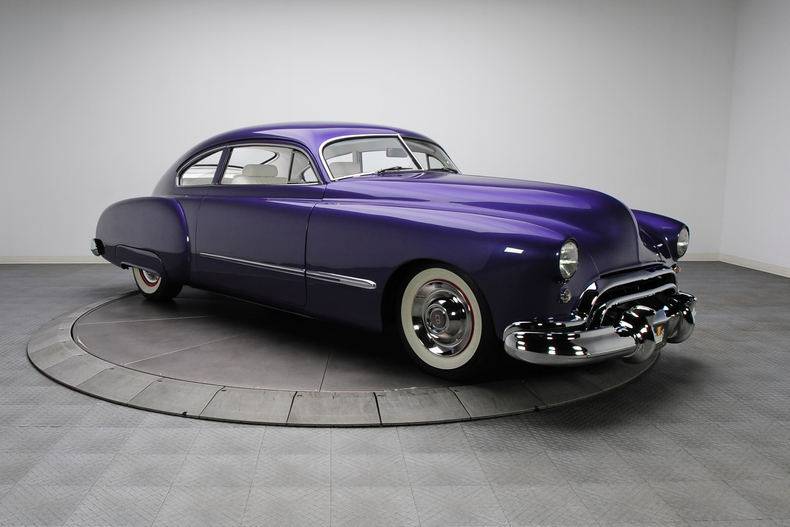 Rarely do cars define the middle ground between those extremes quite as well as this 1948 Oldsmobile Futurmatic 98 does. 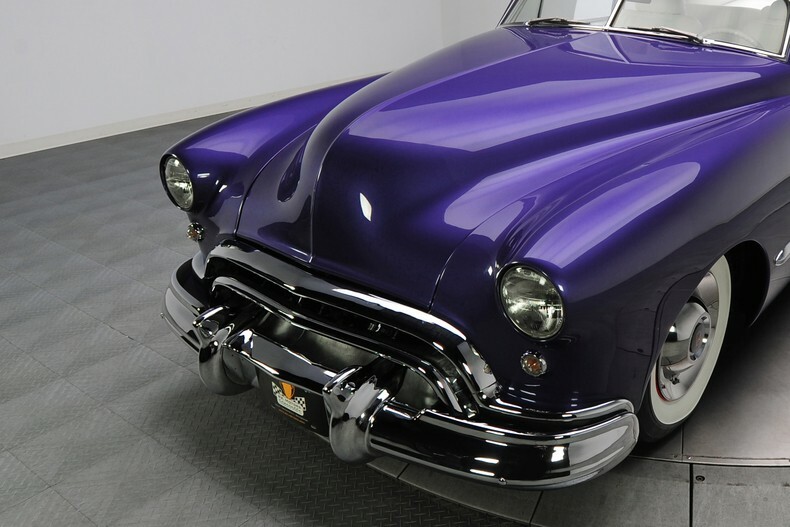 The subject of an extensive frame off restoration, the car features a striking color, extensive body modifications, an amazing custom interior and enough power to silence anyone who dares to think this Olds is all show and no go. 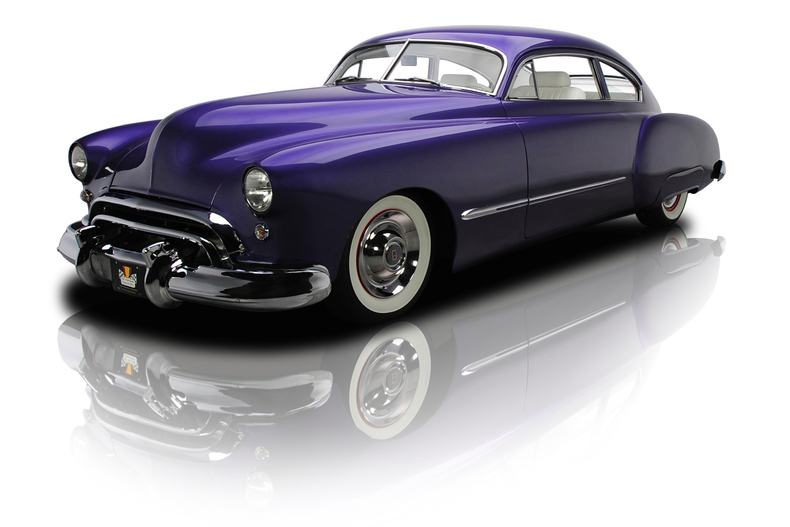 Ready to hit the road in a different kind of lead sled? 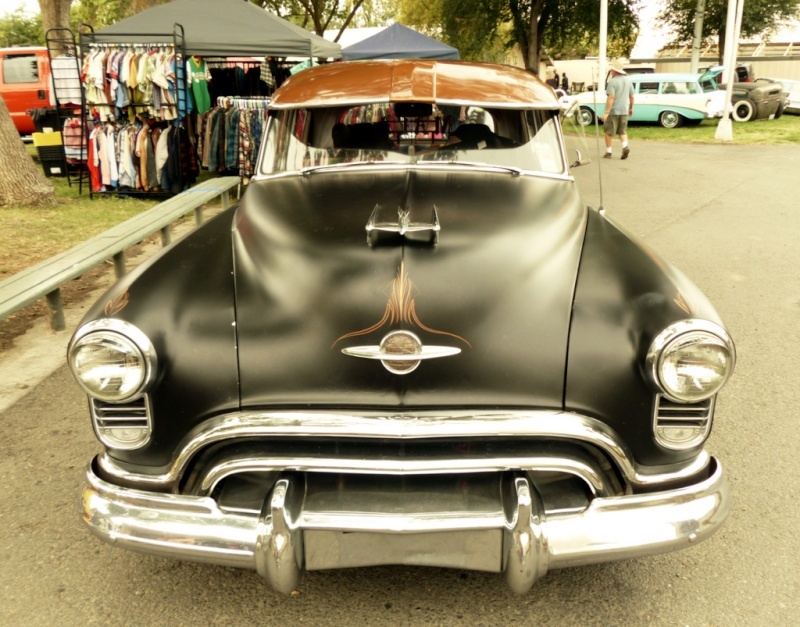 Learn a bit more about this awesome Olds. 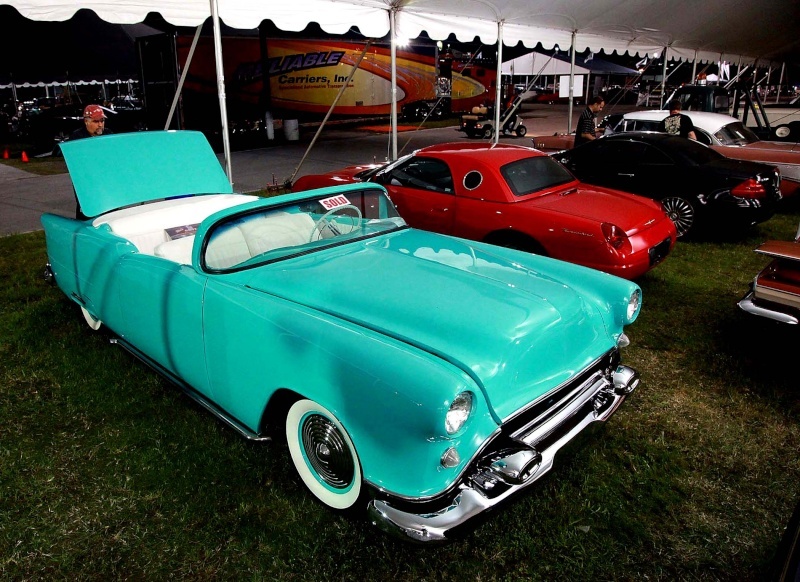 After World War II, U.S. automakers were understandably dead set on looking forward. 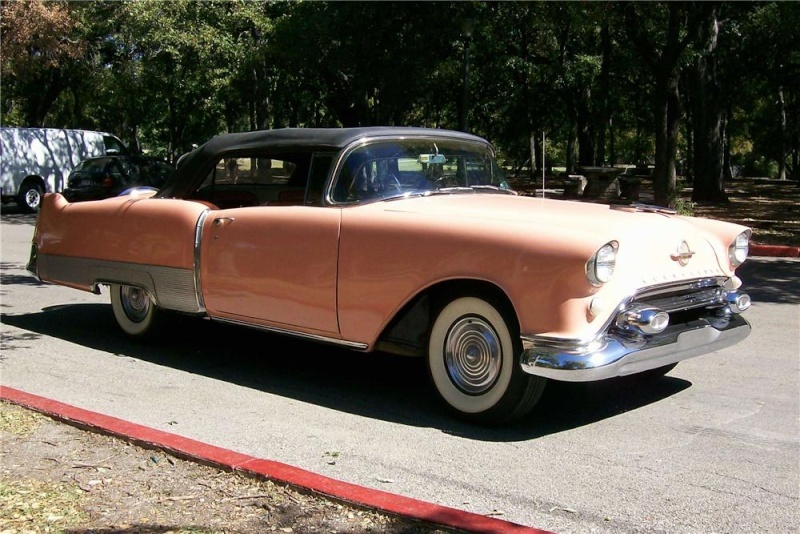 Oldsmobile epitomized that mentality with its “Futuramic” design. 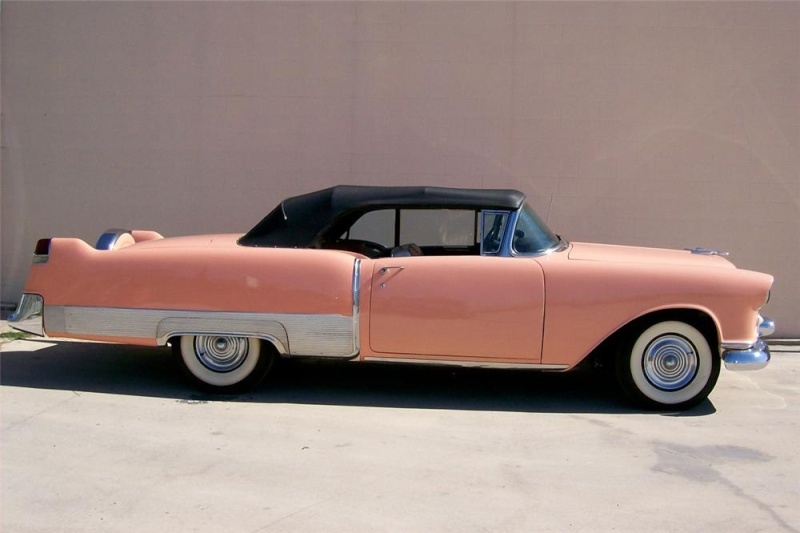 Even the most basic of its 1948 lineup was tagged as “Fulfillment of the Futurmatic idea”. 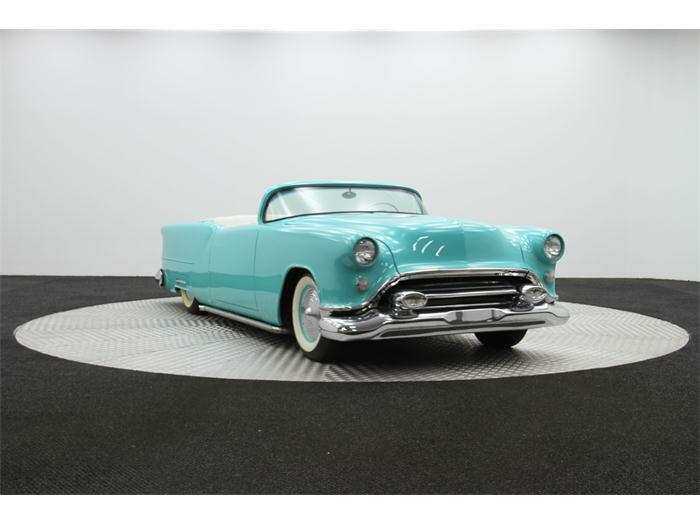 To their credit, the updated Oldsmobile C-bodies were attractive cars and, mercifully, this 98 retains many of those classic lines. What you’ll find upon closer inspection is a compilation of the best traditional body modifications. 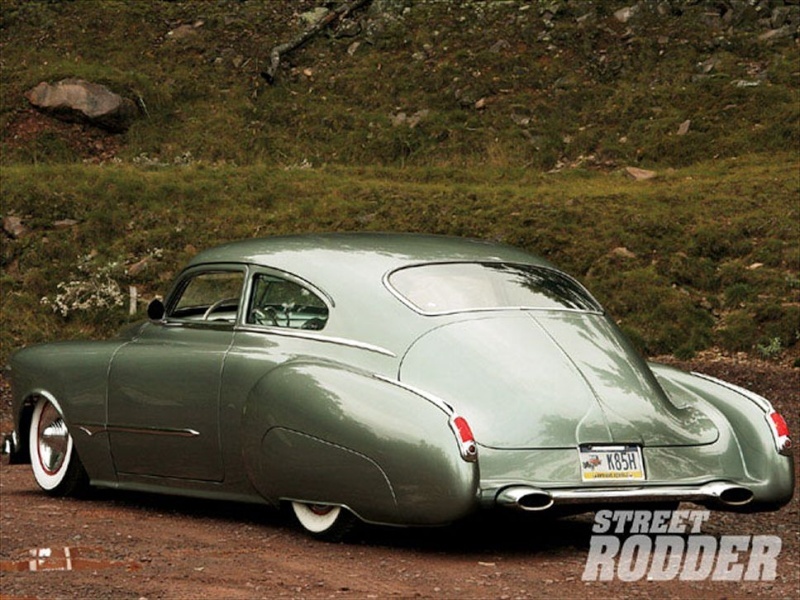 With the shell off the frame, it was nosed, decked, chopped and shaved for the classic lead sled look. 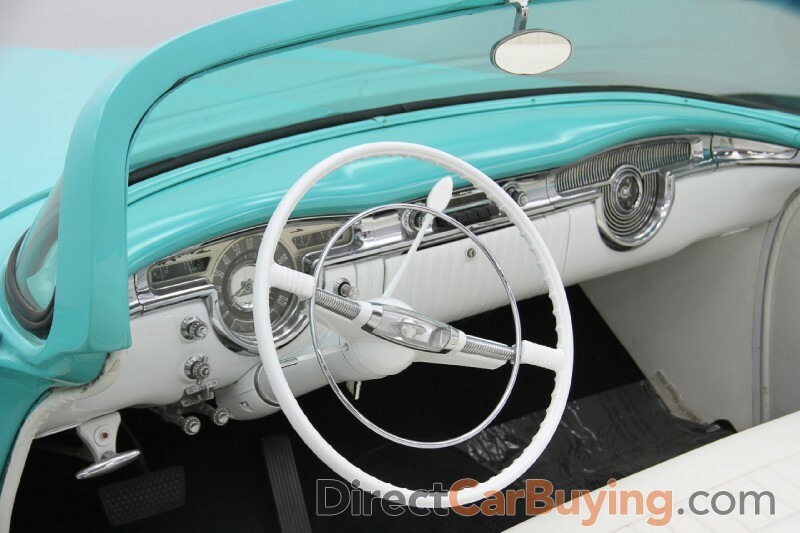 All mods were performed professionally and that is certainly evident in the quality of the finished product. Every panel is arrow straight with excellent panel fitment. 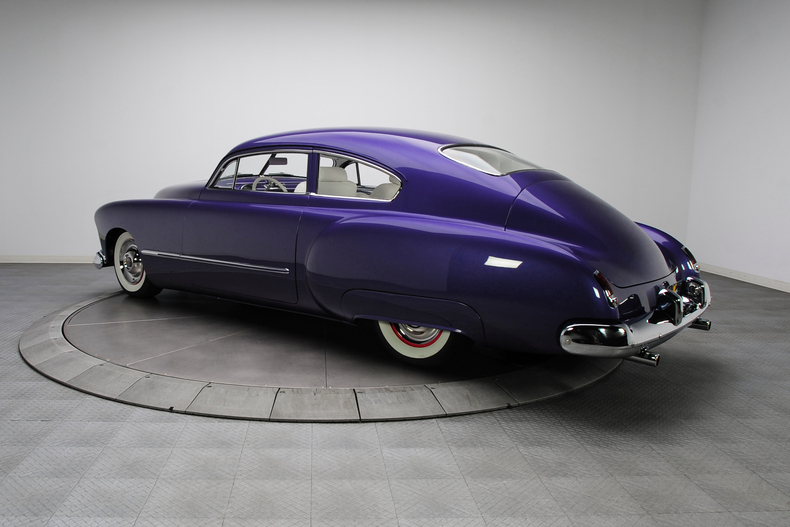 The completed body was shot with a coat of Martin Senour Purple Metallic paint. 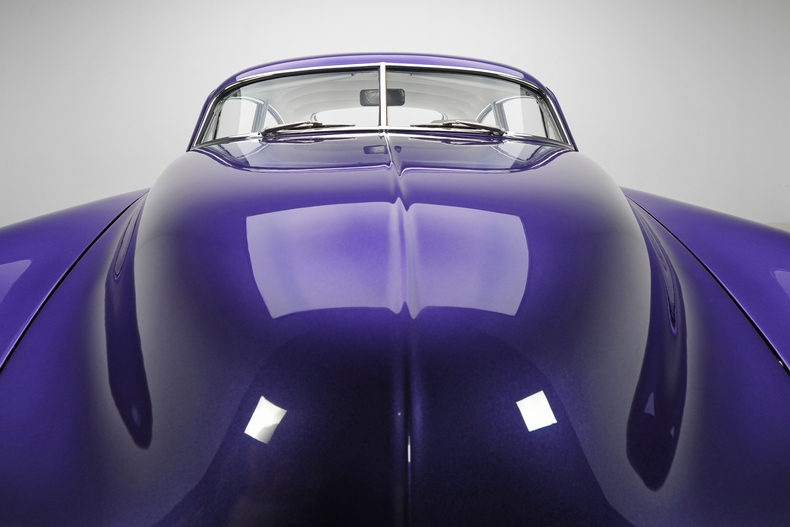 A medium purple with plenty of flake, the color suits the smoothed body well while easily standing out from the crowd. Of course, the difference between a good custom and great custom lies in the details. Unlike many similar builds, this one isn’t a hodgepodge of multiple OEM parts bins. 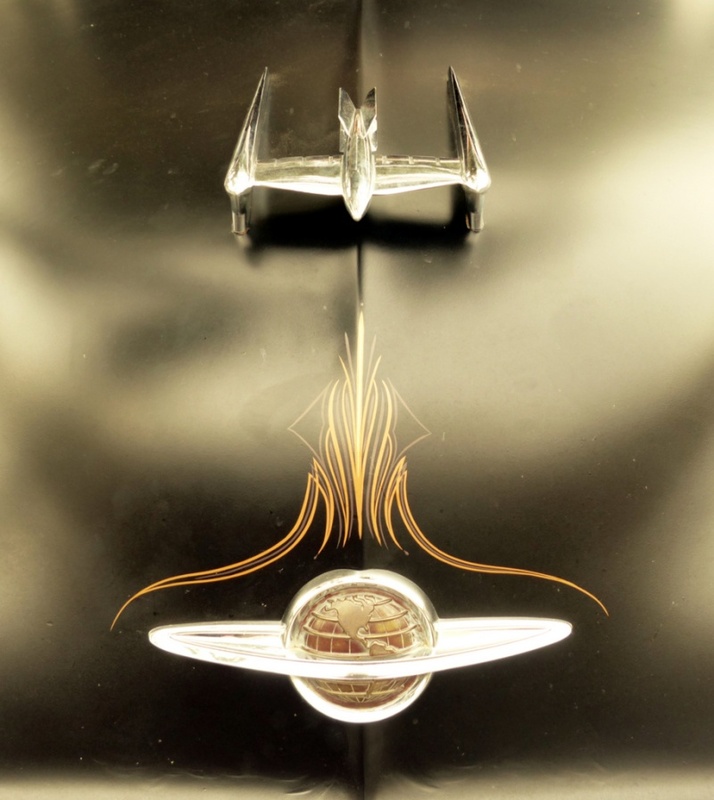 Nearly every piece of ornamentation was produced by Oldsmobile. At the front, frenched headlights provide a modernized look while a stock chrome grille with two upside-down “U” bars makes sure the front end is easily recognizable. 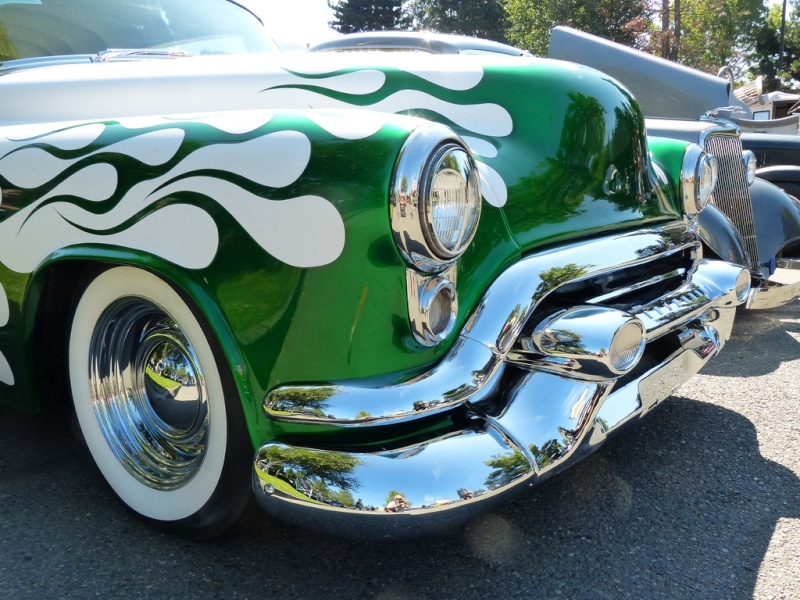 At the sides, all rear fender trim has been shaved, but the solitary chrome strip that runs from the front fenders to the doors remains for some authentic style. Up top, clean custom glass fills in the spaces between the roofline and door line with showroom quality stainless surround every piece. 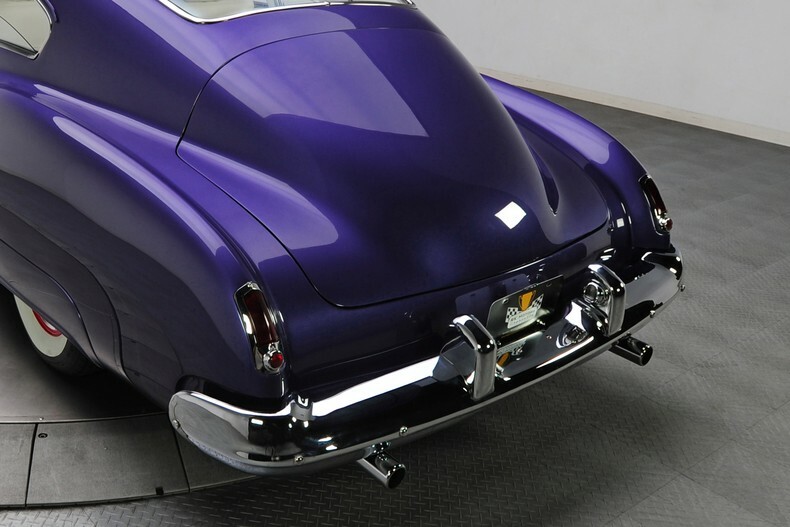 The sloping rear terminates into another factory chrome bumper with stock taillights capping off the rear fenders. 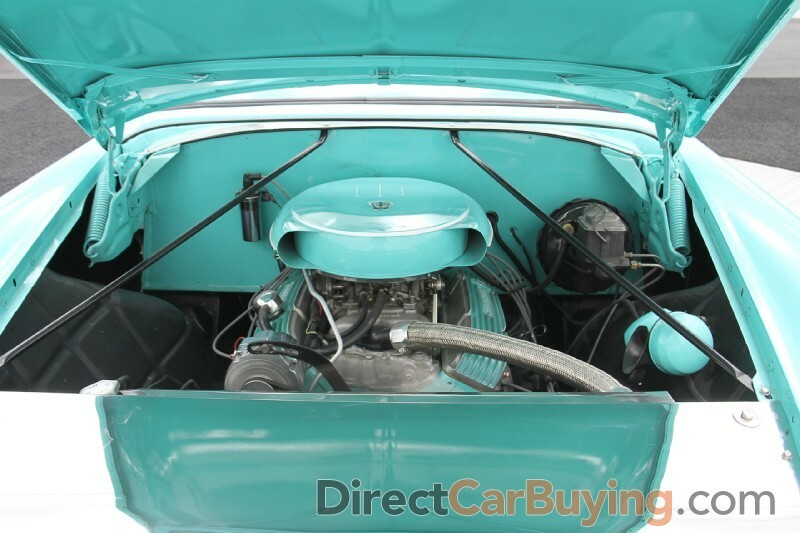 Under the elongated hood, Olds enthusiasts will be pleased to find a 455cid V8 borrowed from a 1968 Cutlass 442. 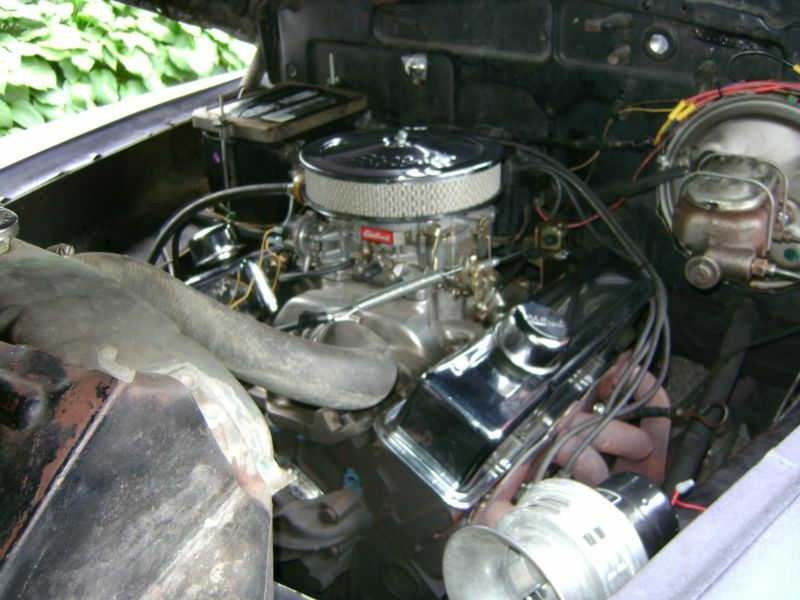 Legendary for their low-end grunt, this big block was plenty capable in stock form. Of course, this one has a few tricks up its sleeve to make sure this cruiser stays ahead of the pack with ease. 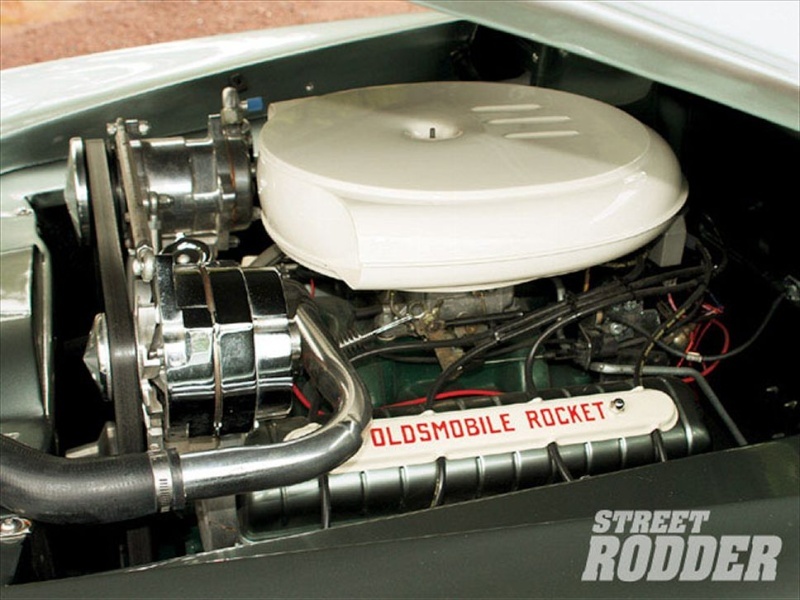 Up top, a chrome W-30 style dual scoop air cleaner with an “Oldsmobile Rocket 455” decal on the top and an “Offenhauser-equipped” decal on the front, feeds air into a single Holley 4-barrel carburetor. 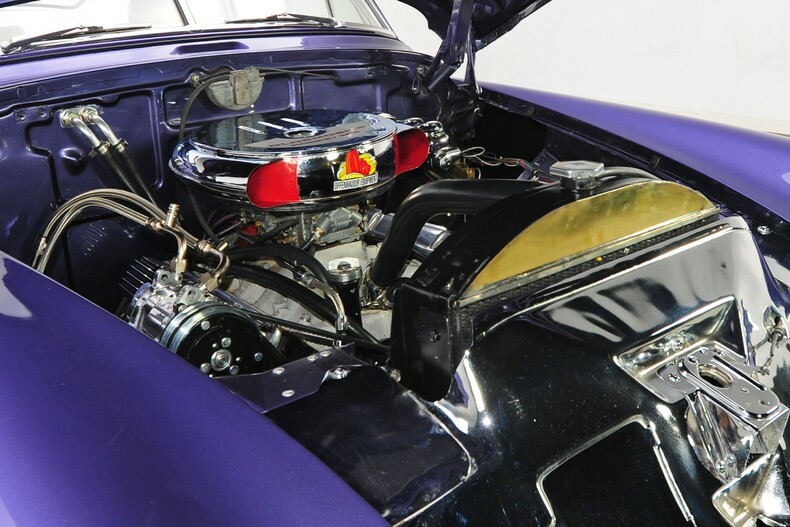 That atomized fuel is sent into a painted Edelbrock Torker 455 intake manifold that appropriates juice to the cast iron heads wearing attractive finned aluminum valve covers. Up front, a polished pulley system utilizes crank power to spin a chrome alternator, power steering pump and air conditioning compressor. At the heart of the package is an aftermarket cam with .485 intake intake lift and .490 exhaust lift, helping the mill generate an estimated 434hp @ 5,000rpm. 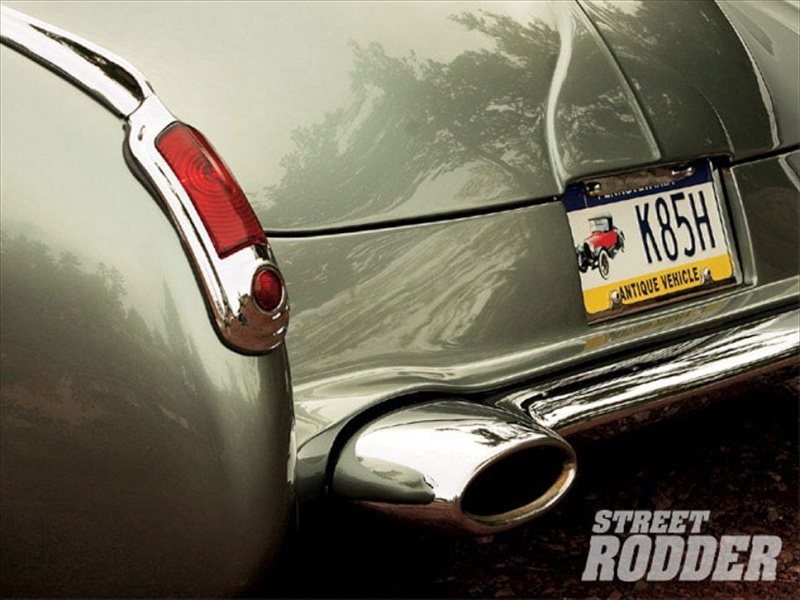 Breathing through a set of coated headers into a true dual exhaust system with Hushpower mufflers, the car has the perfect tone for boulevard cruising. Peer underneath and you’ll find a nicely detailed undercarriage with the floors, frame and x-brace painted satin black. 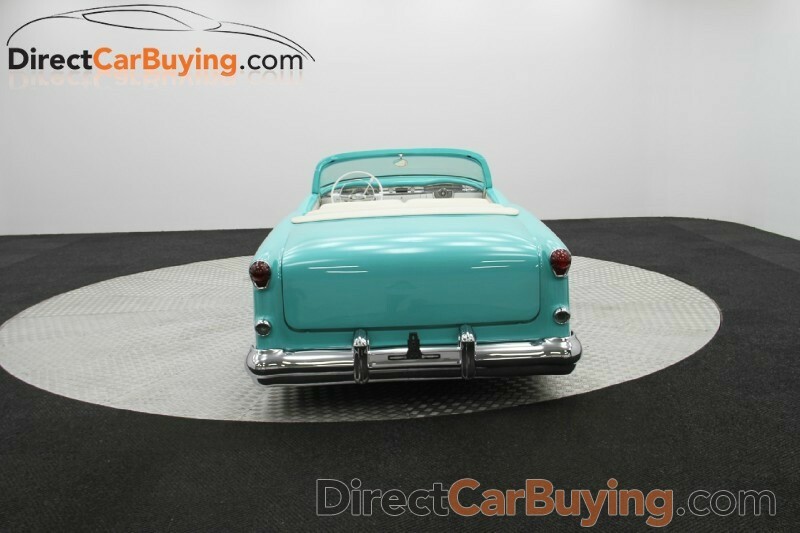 Behind the monstrous 455 V8 is an Oldsmobile TH400 automatic transmission that makes cruising this 98 a relaxed experience. 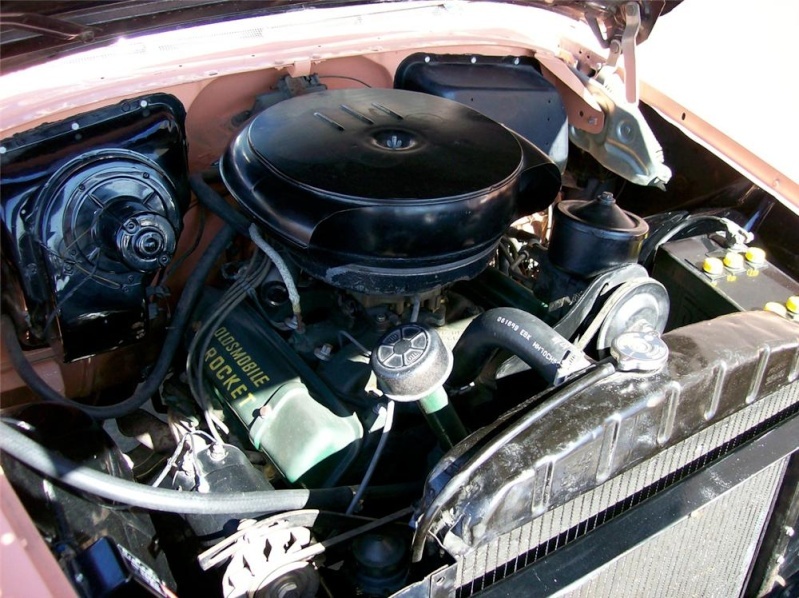 Minus the bell-housing pattern, it’s the same durable GM three-speed that’s appeared in everything from trucks to exotics over the years. Further down the driveline, a sturdy GM 10-bolt differential puts the horsepower to pavement. 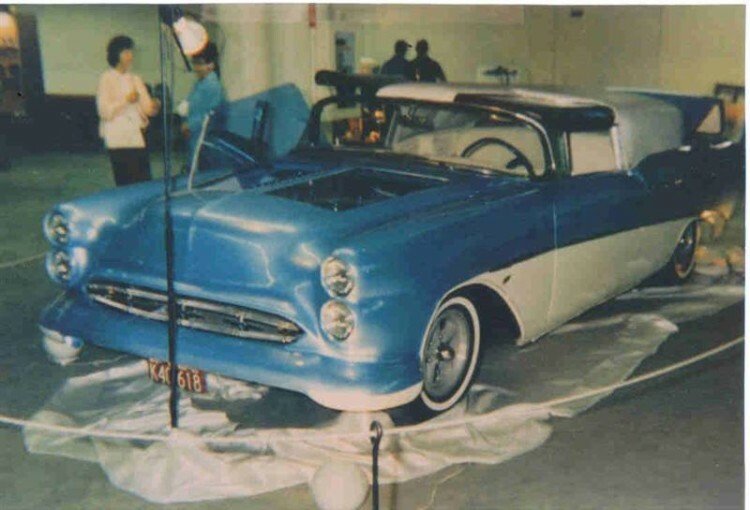 Around the drivetrain, a modified Oldsmobile chassis features a Chevelle front clip with double A-arm suspension coupled with a NASCAR-style trailing arm rear setup. 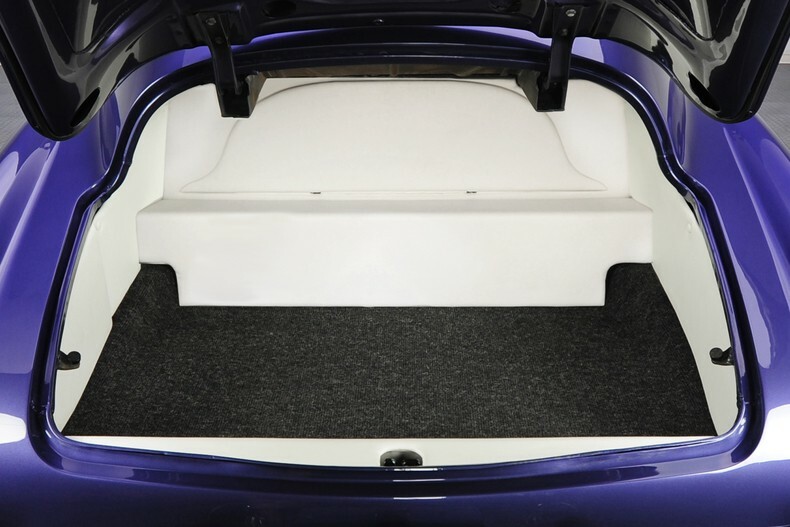 The end result is a chassis that provides a comfortable ride while remaining confident in corners. Overall driving effort is greatly reduced by power steering and power brakes that clamp down the calipers on four-wheel discs, giving the car a modern feel on the road. 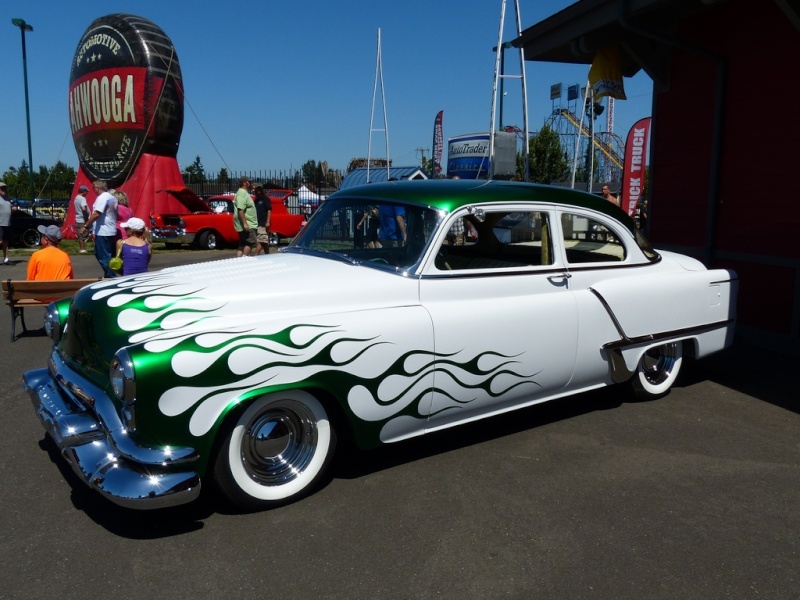 At the corners, 15-inch steel wheels with Oldsmobile dog dishes are wrapped in 215/75R15 Firestone white walls that match the car’s overall theme perfectly. 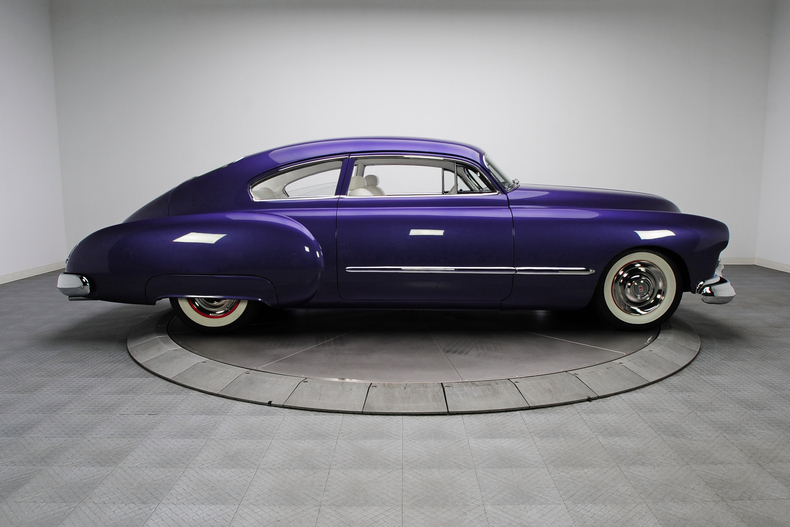 Between the doors on this kustom, a show-stopping white interior looks awesome beside the purple paint. 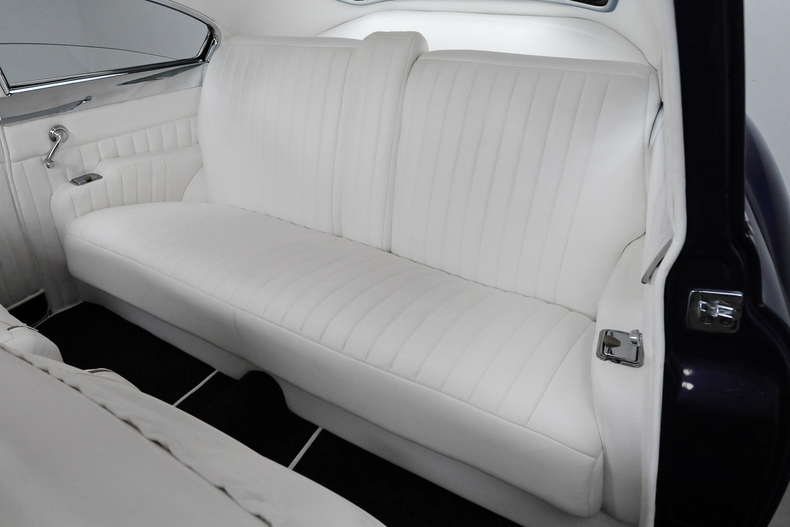 The front buckets and rear bench are covered in rolled and pleated white Ultraleather, as is the headliner and visor. 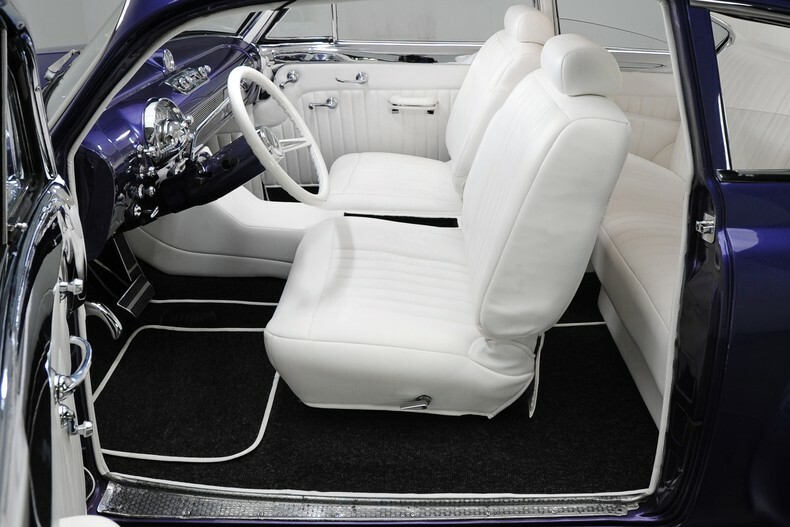 Between the front seats, a custom center console, also wrapped in white, houses controls for the Vintage Air climate control system. 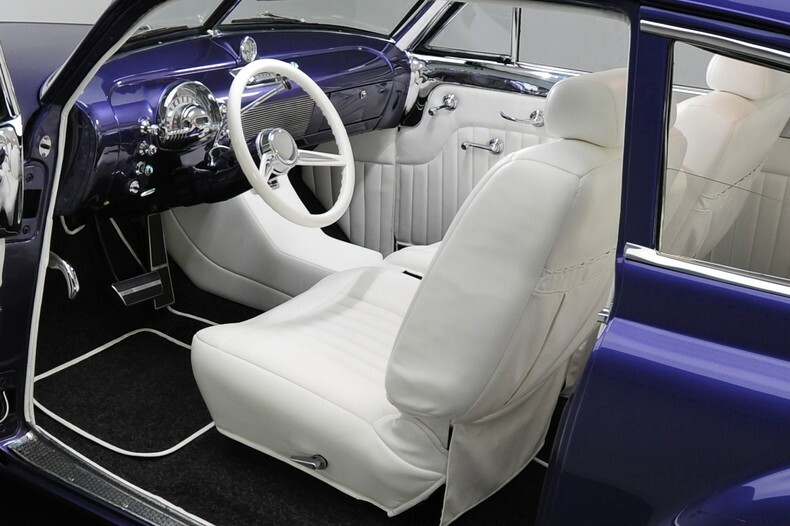 At either side, custom white door panels feature chrome toppers that tie in perfectly with the factory style dashboard. 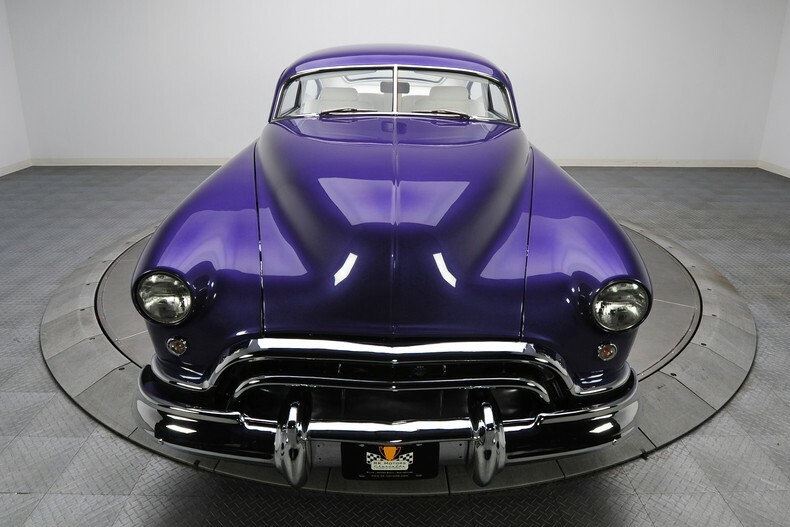 That dash, an all steel Oldsmobile piece, sports the same purple metallic as the exterior, while providing space to hang tons of period correct brightwork including the center grille, AM radio, analog clock and the stunning stock gauge cluster that keeps an eye on that strong 455. 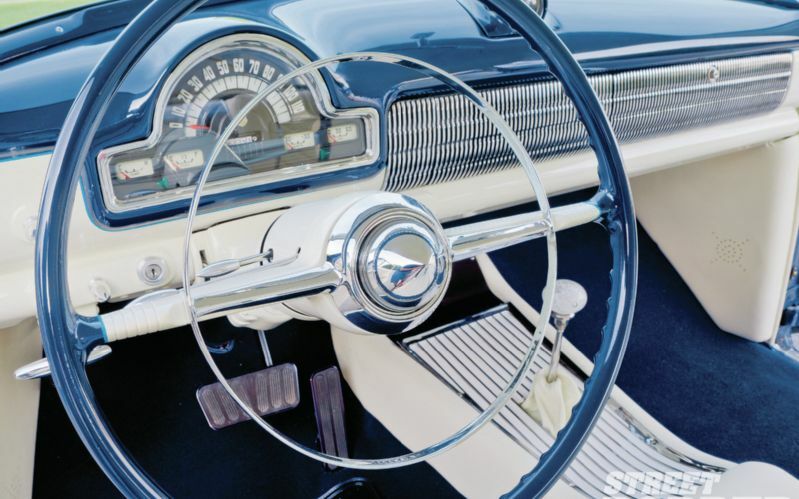 Around the gauge cluster, chrome pulls operate the basic features such as lights and windshield wipers. 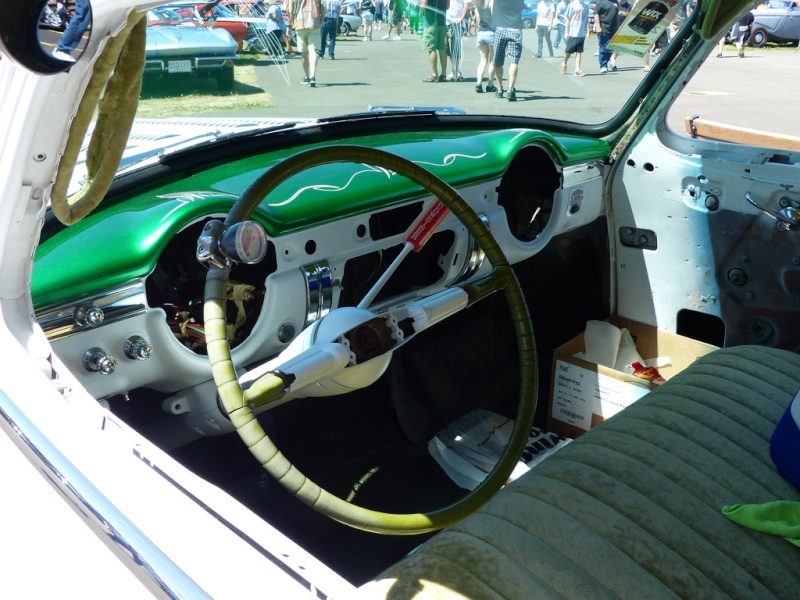 A white-rimmed billet steering wheel offers the driver a connection to the road through a body color tilt steering column. At the ground level, dark gray carpet provides some visual relief from the sea of white. 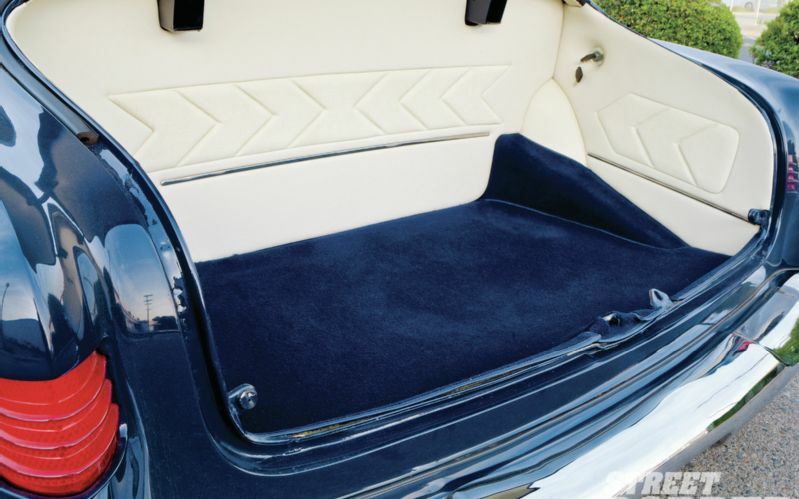 Behind the cabin, the trunk hides the battery and other accessories behind pleated white leather panels. Documentation includes a small binder with detailed build photos as well as a brief write up that covers basic specs. 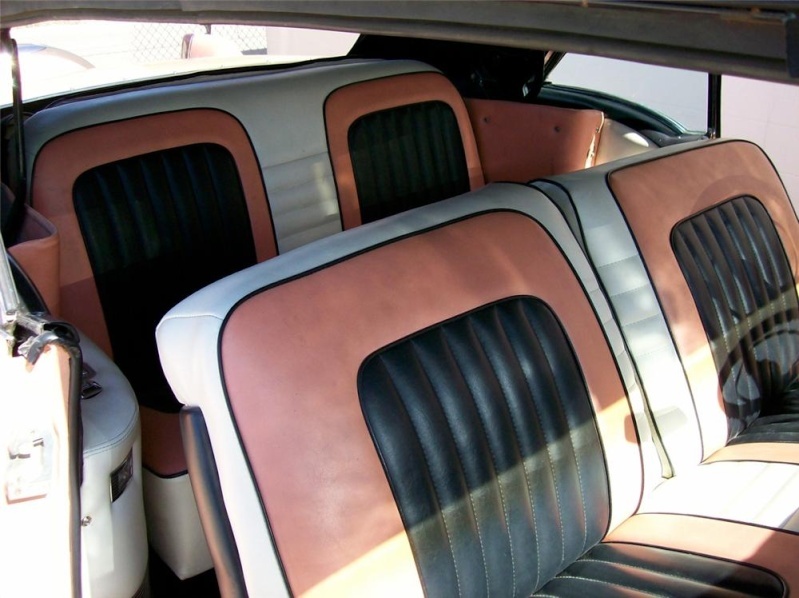 Wild enough for the custom crowd but subtle enough to win nearly universal appeal, this Olds has all the right checklist items for anyone that wants to cruise in both comfort and style. 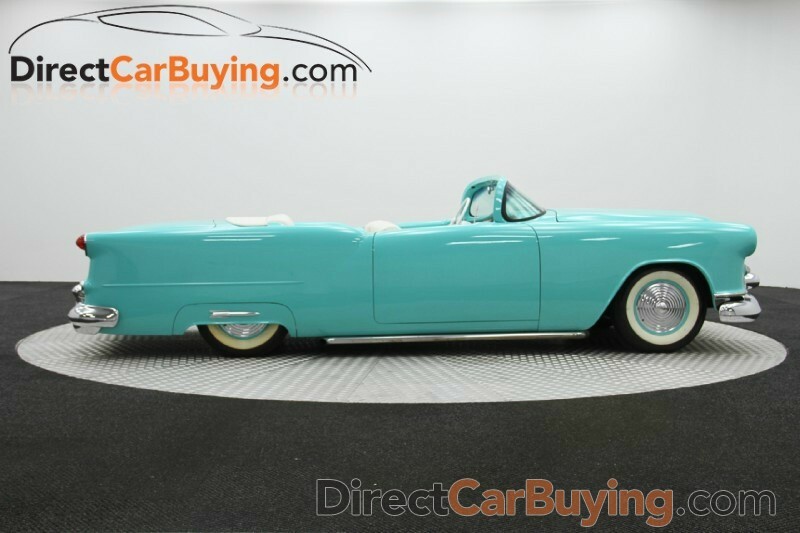 If you’re in the market for a traditional lead sled, don’t miss the chance to bring this 1948 Olds home.